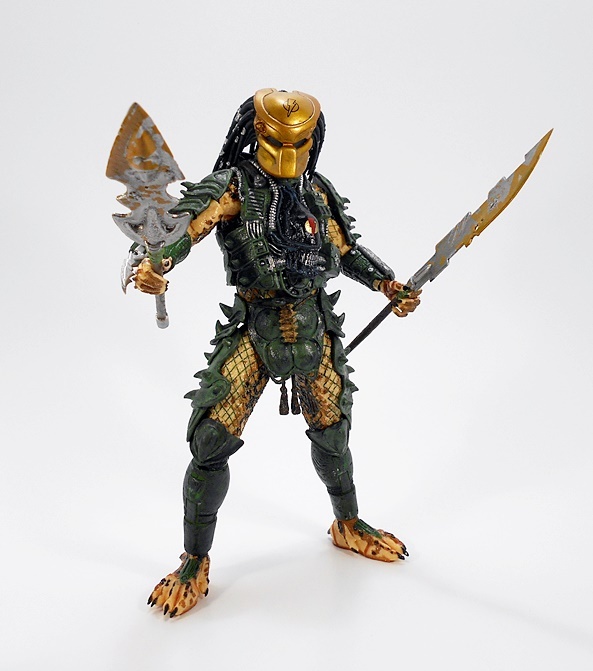 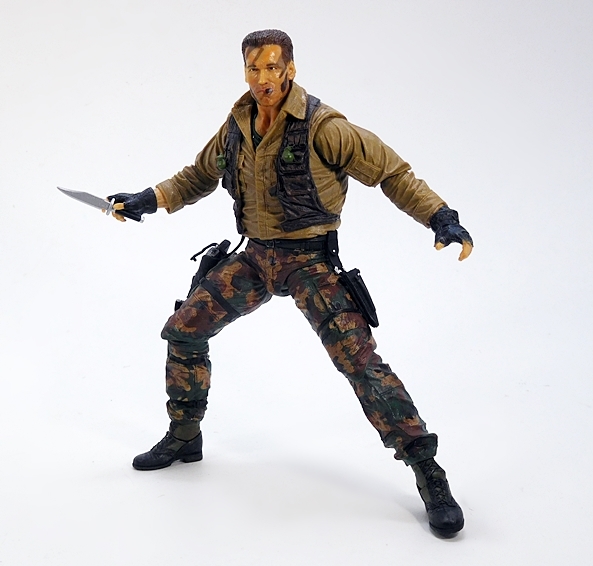 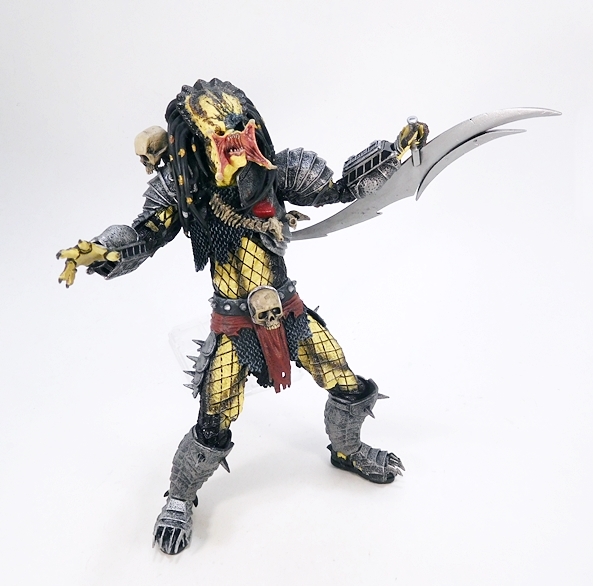 I originally promised myself I’d stick to just the Ultimate Predator releases, but when it comes to buying toys, I can’t be trusted… not even by myself. 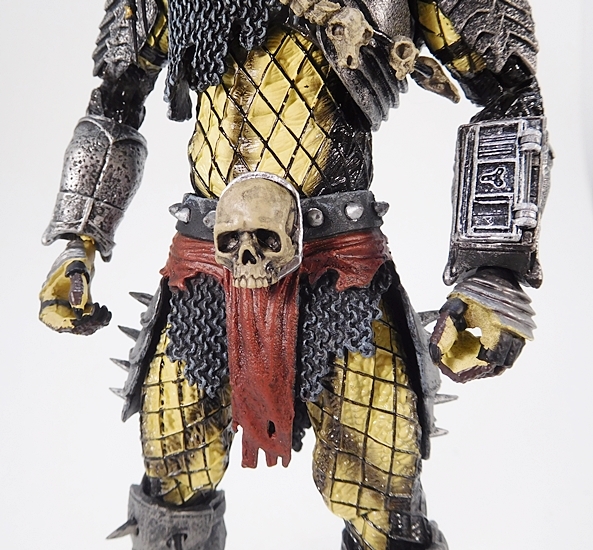 And so, I was in one of those big chain bookstores, which seem to sell more toys than books now, and this fella was calling out to me. 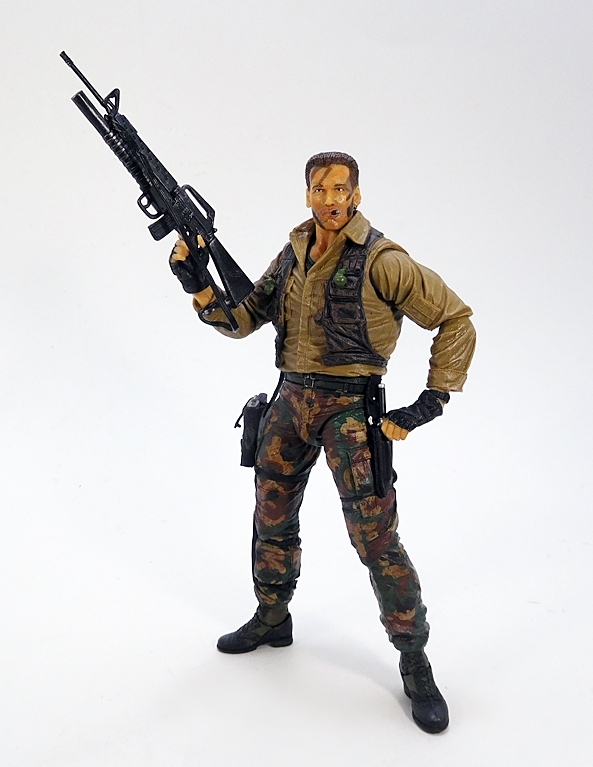 There was no way I could leave him behind on the shelf. 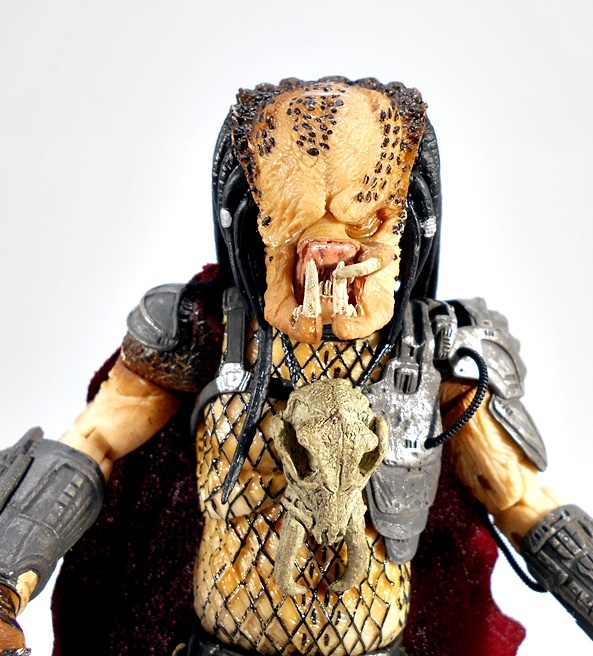 I loved the look of the bookish old lady that was working the register. 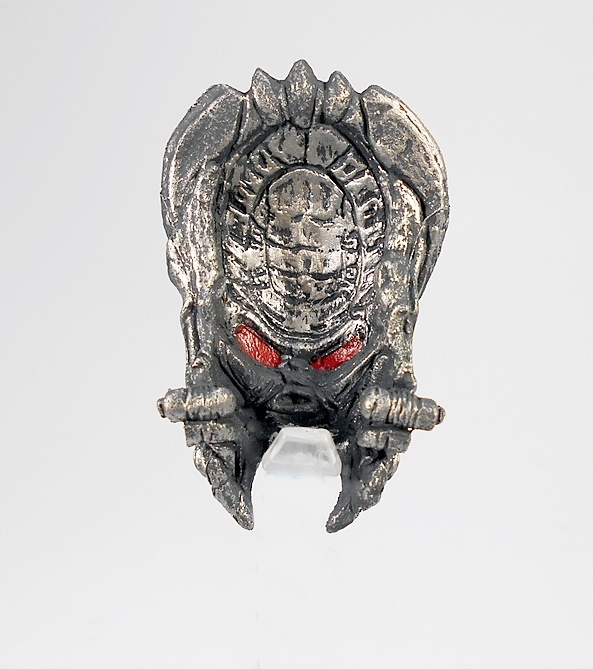 She looked surprised and appalled at what I was buying. 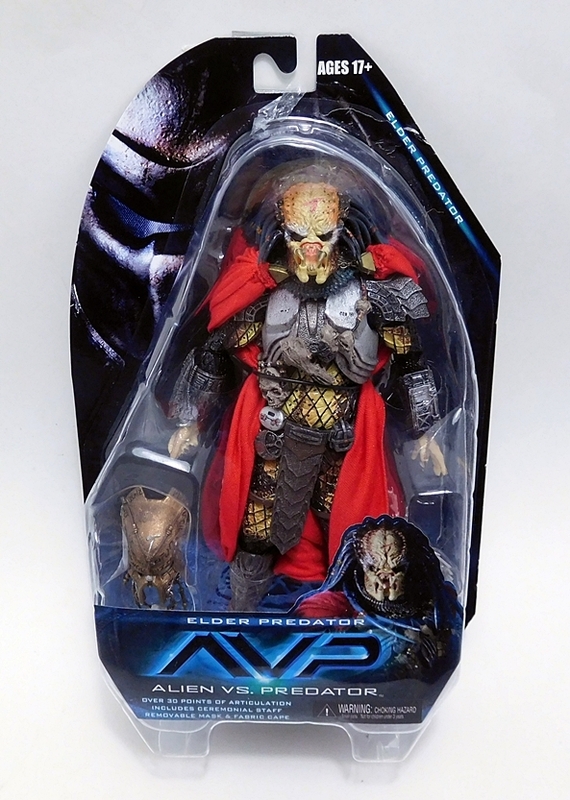 Why do you fill your shelves with these and then act surprised when people buy them? 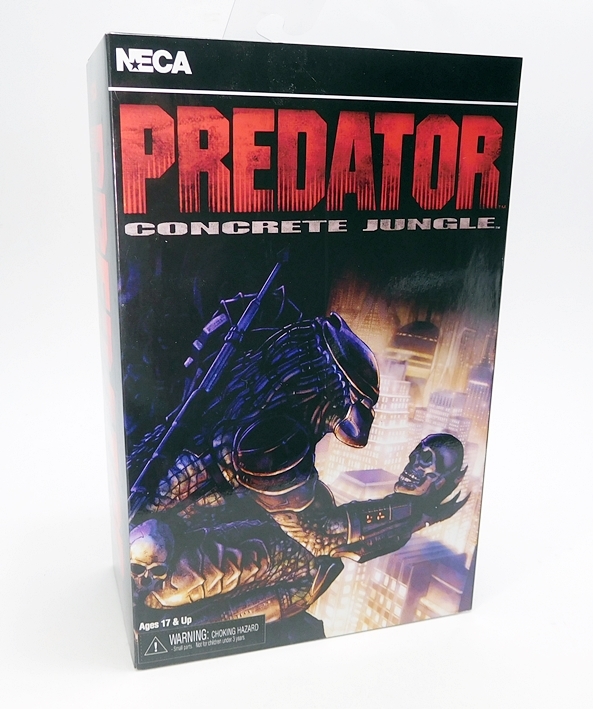 I’m used to seeing sealed clamshells for a lot of NECA’s lines, but this is just a bubble on a cardback. 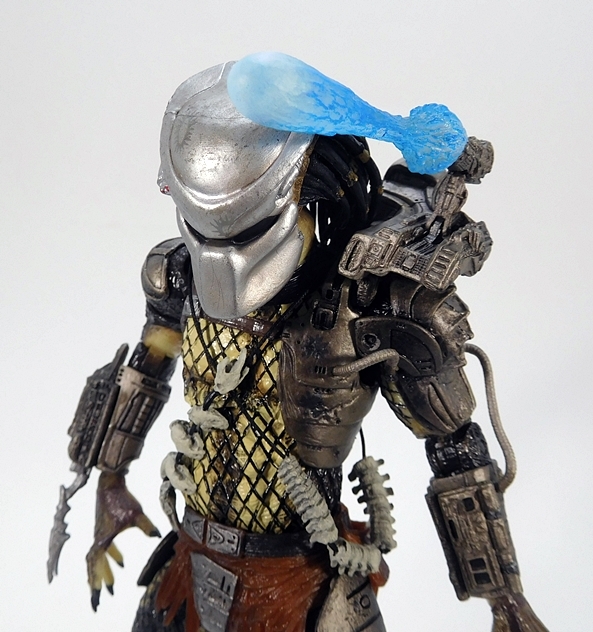 I’m not complaining, mind you, as it’s easier to get into and still dispenses that lovely rush of plastic fumes. 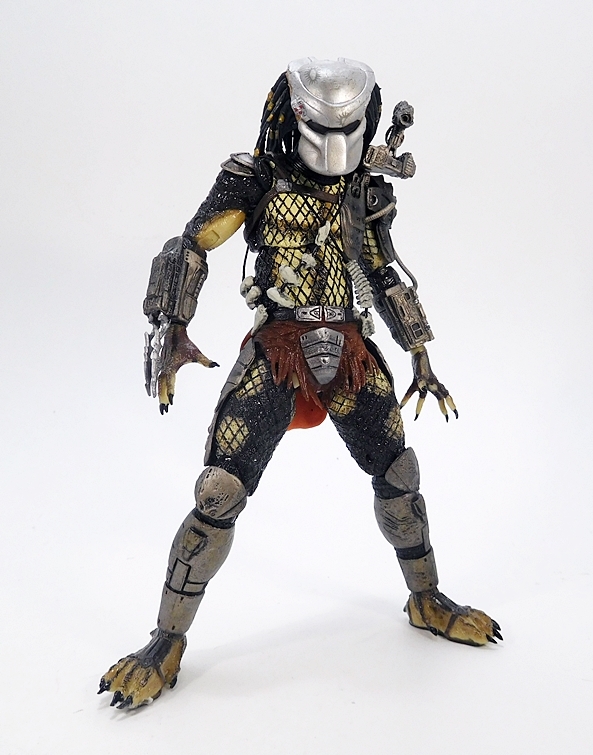 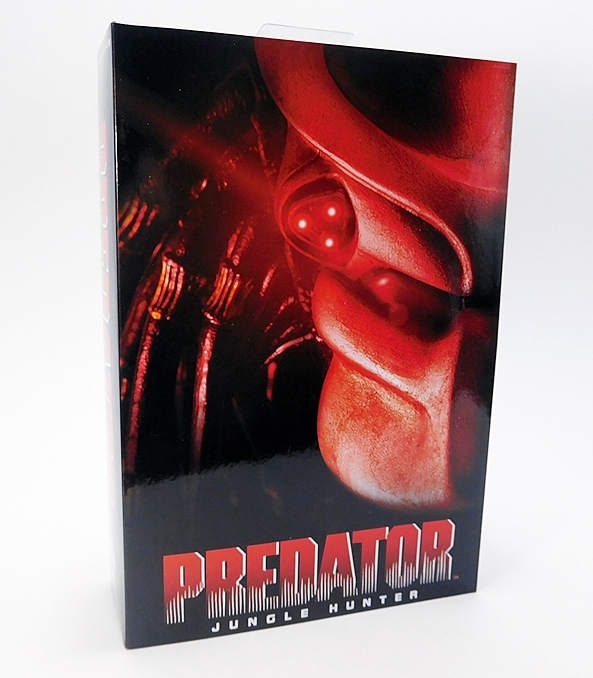 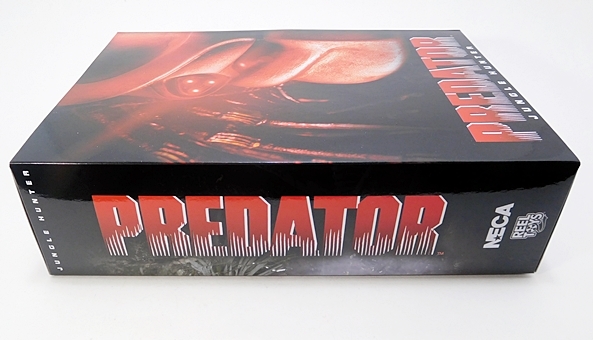 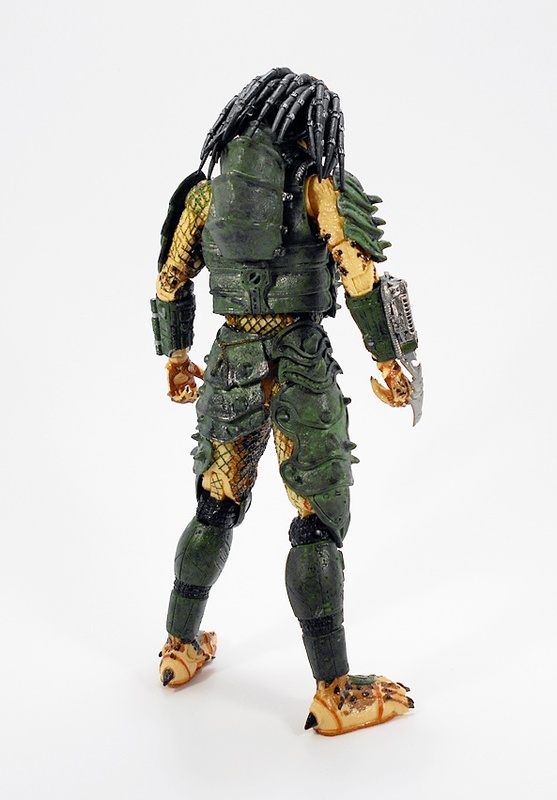 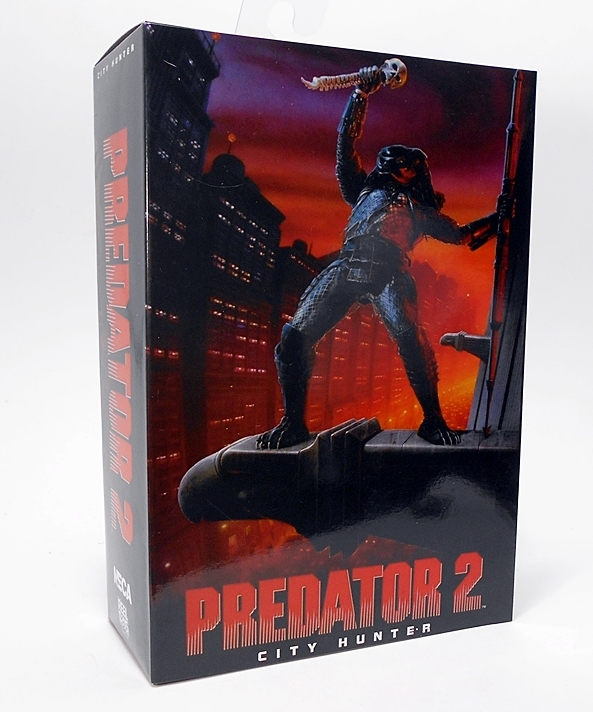 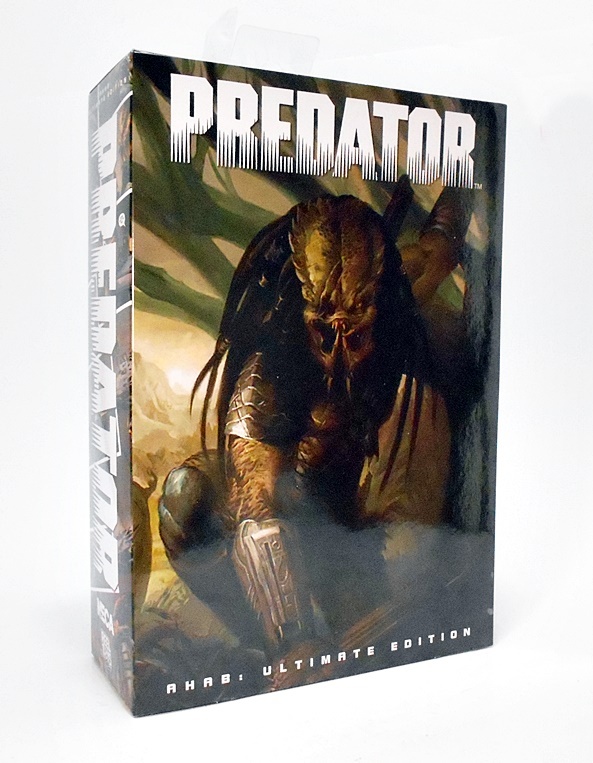 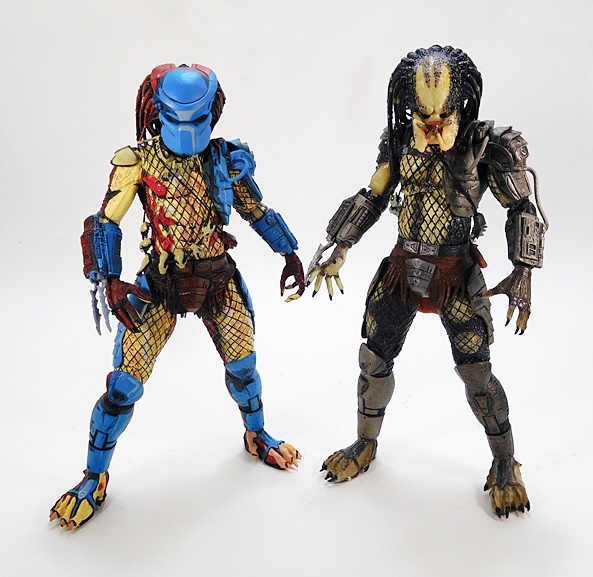 If you like your Predators mint-on-card, the package is designed to stand up as well as swing from a peg. 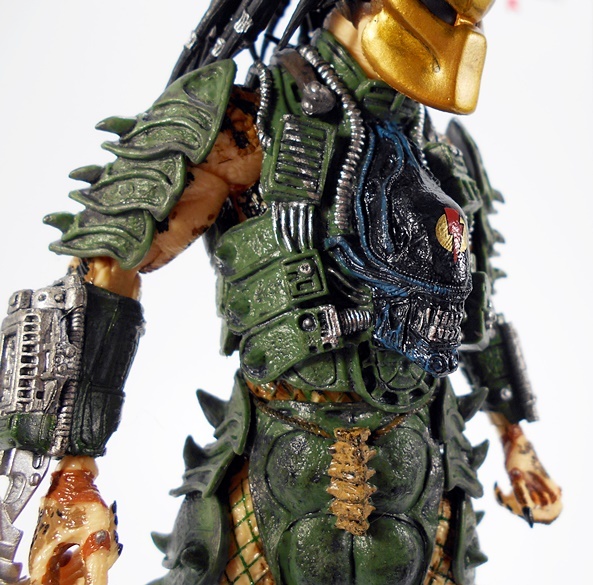 I remember an Elder from the end of Predator 2, but not so much in AVP. 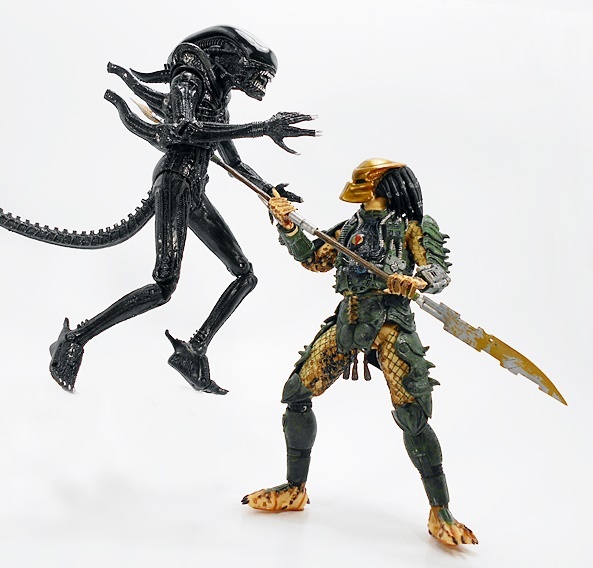 Although, I should qualify that statement by admitting that I’ve only seen AVP once because I hated it. 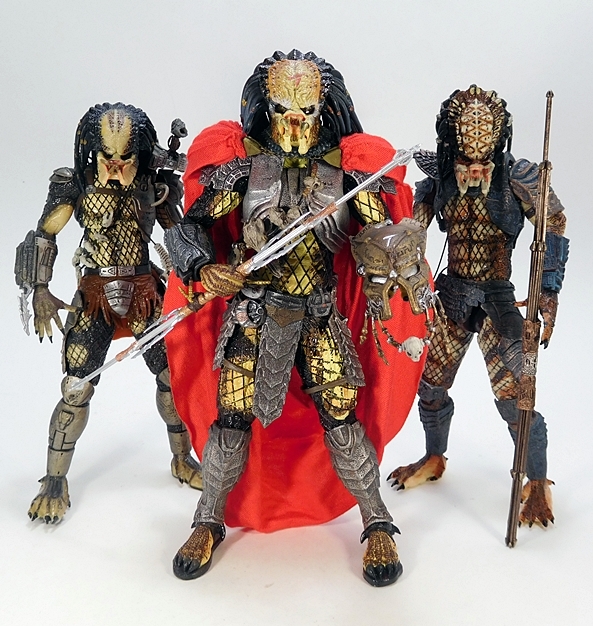 But Predators? 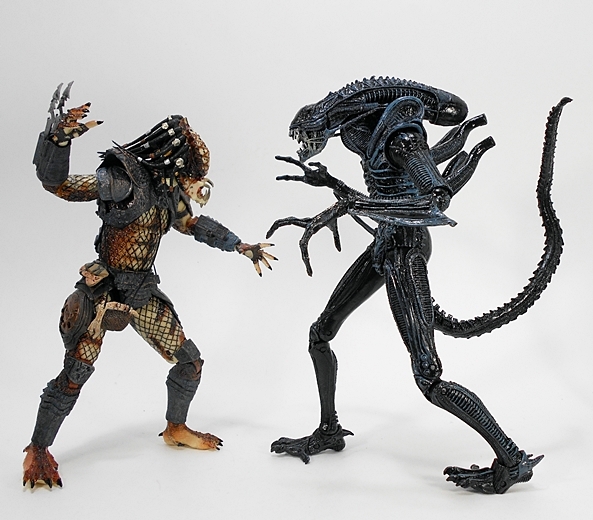 I like them plenty, no matter what movie they’re in… I don’t judge! 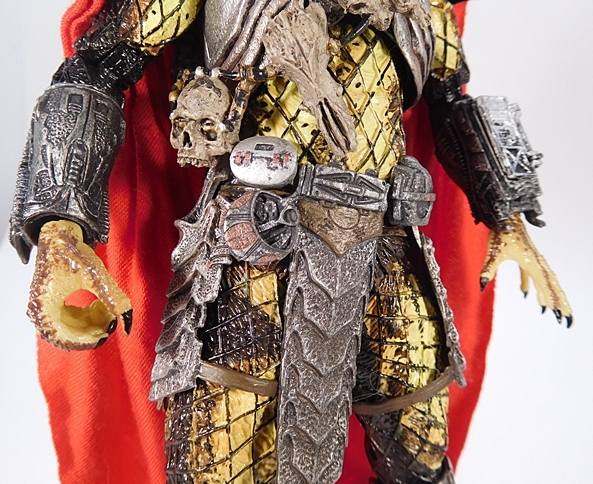 And this is one regal looking fellow! 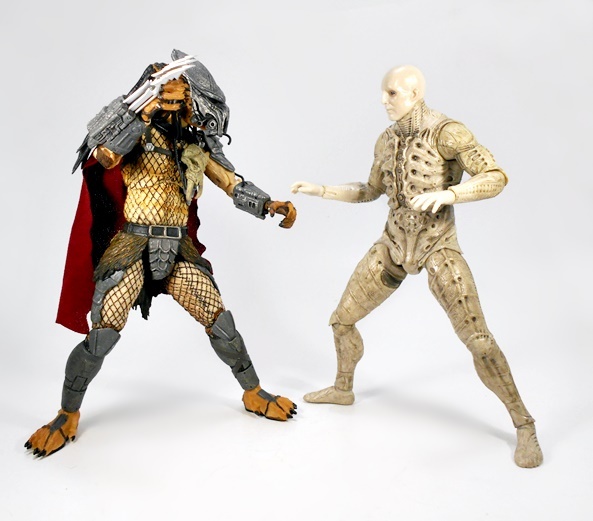 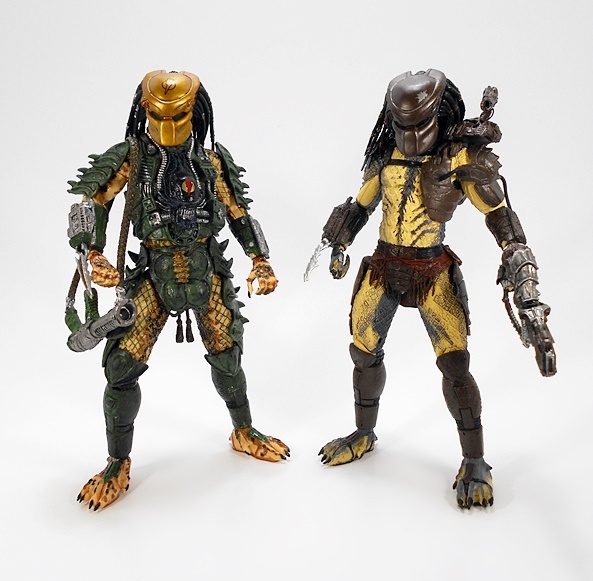 One of the things I love so much about these figures is that the Predator designs all tend to blur together in my memory, but when I get the figures in hand and line them up, it’s so much fun to pick out all the differences. 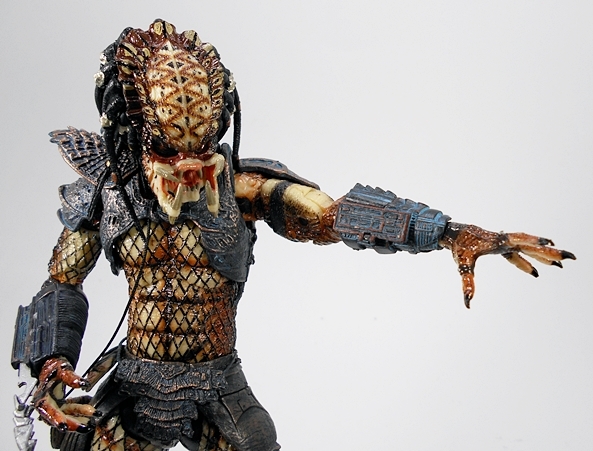 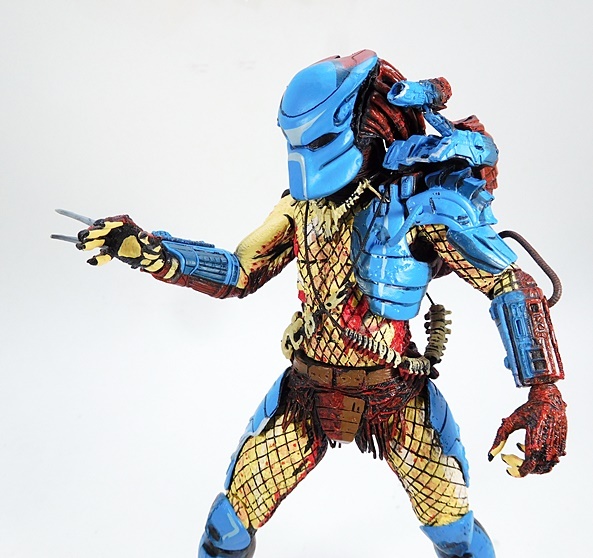 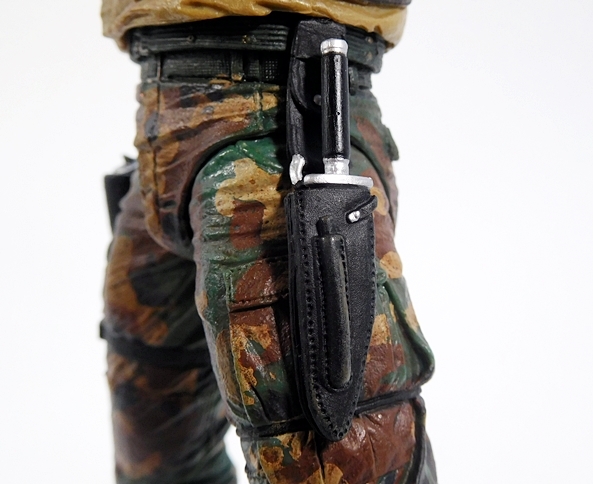 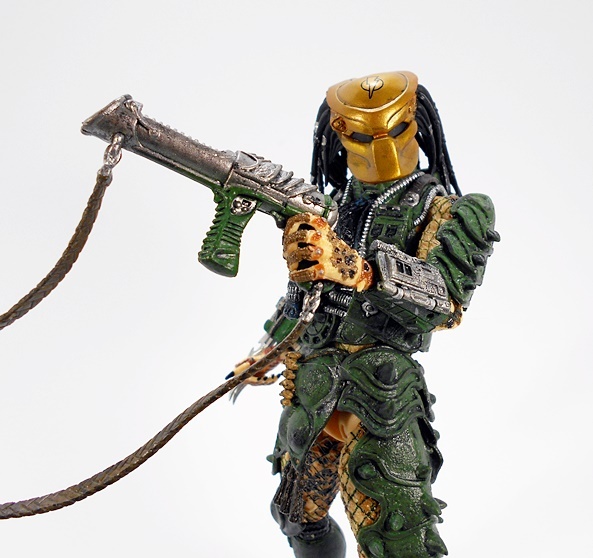 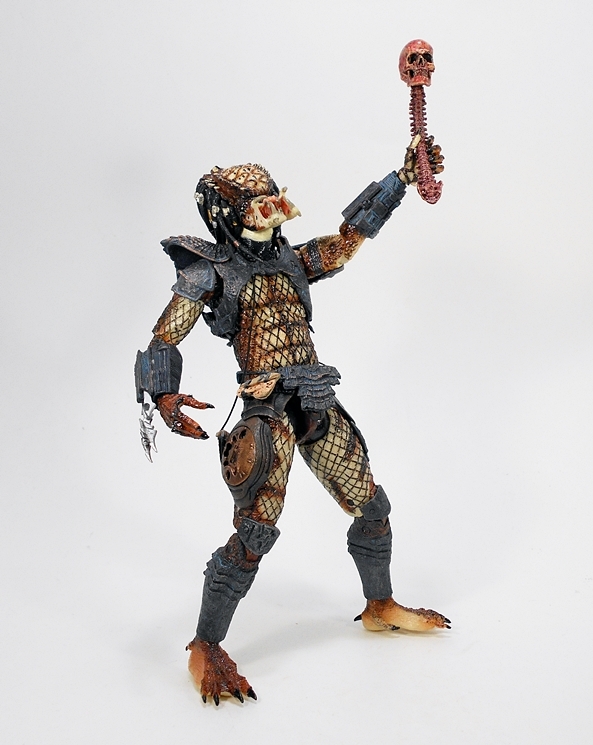 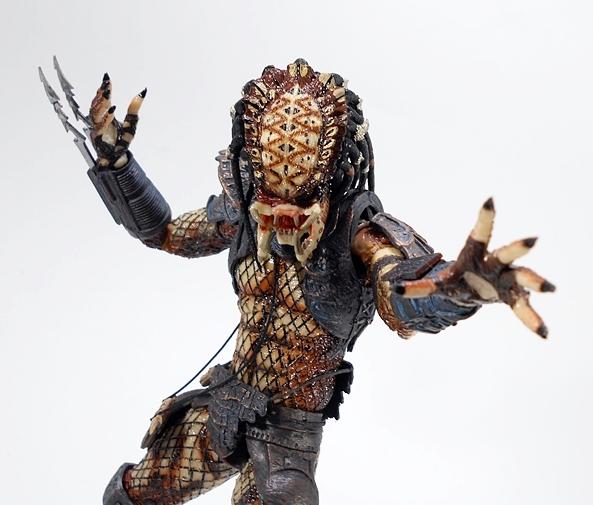 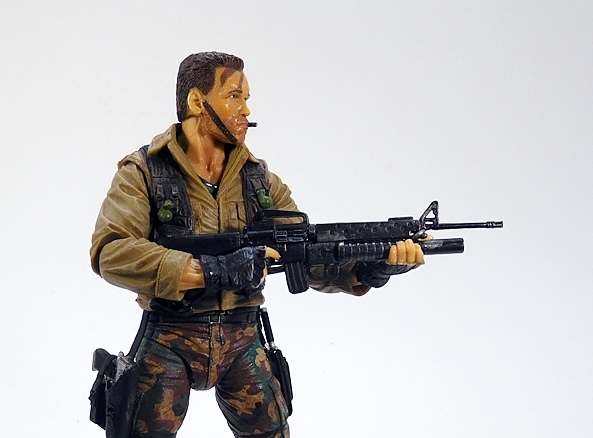 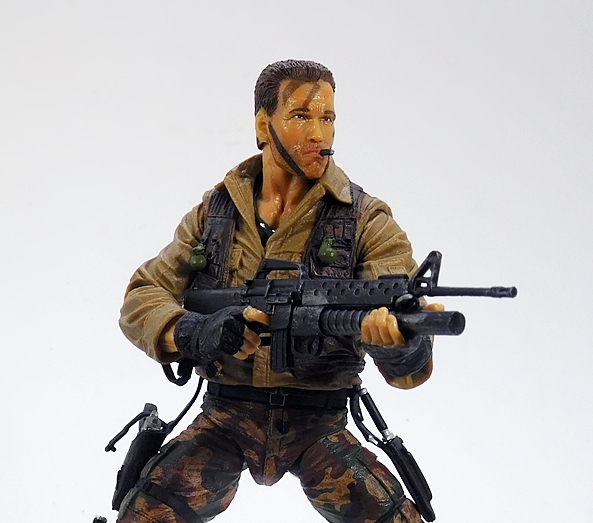 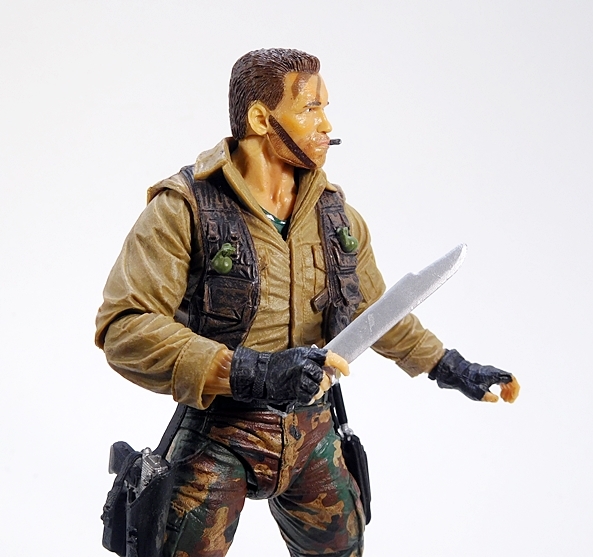 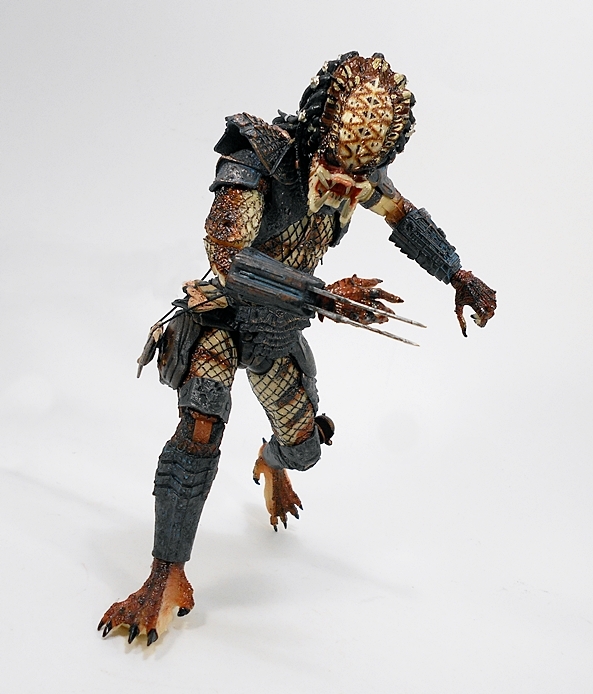 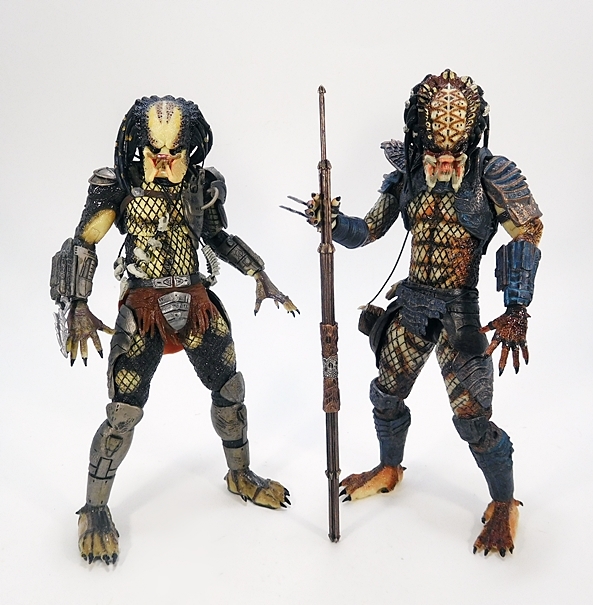 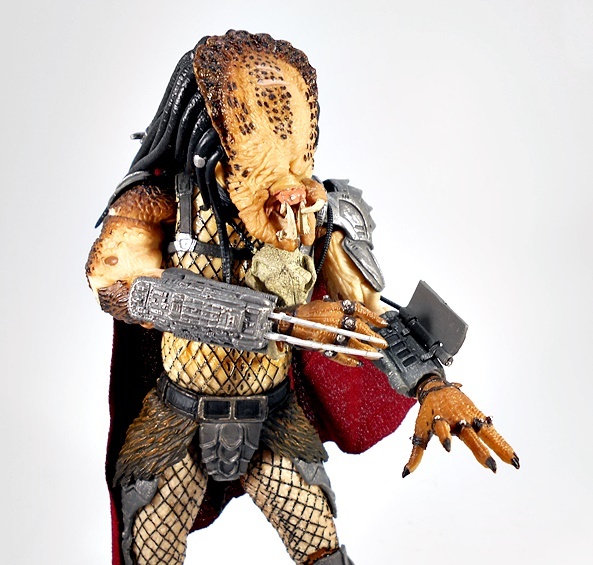 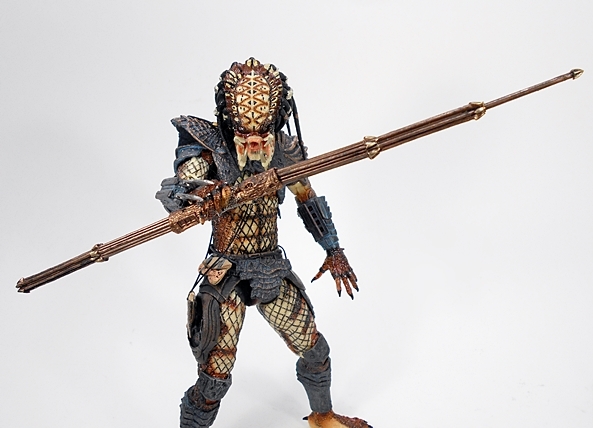 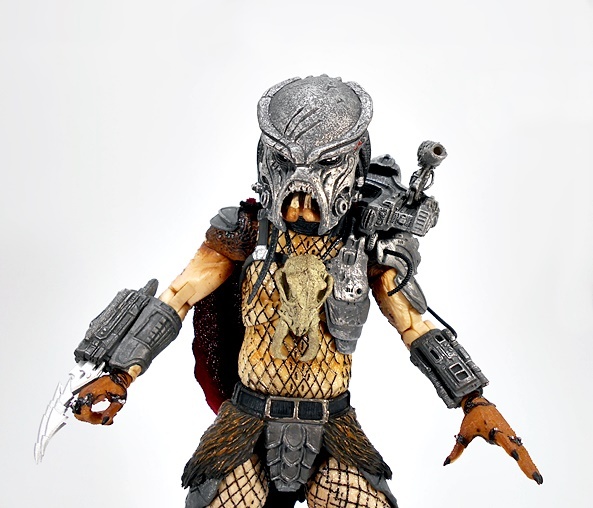 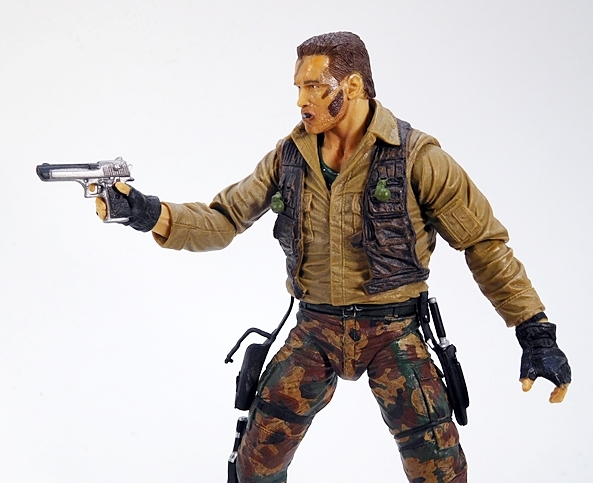 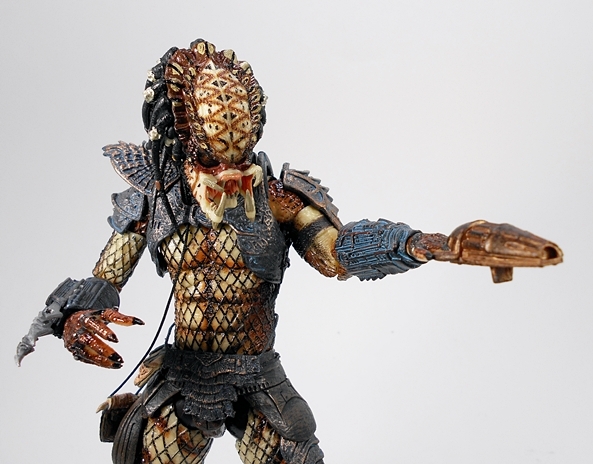 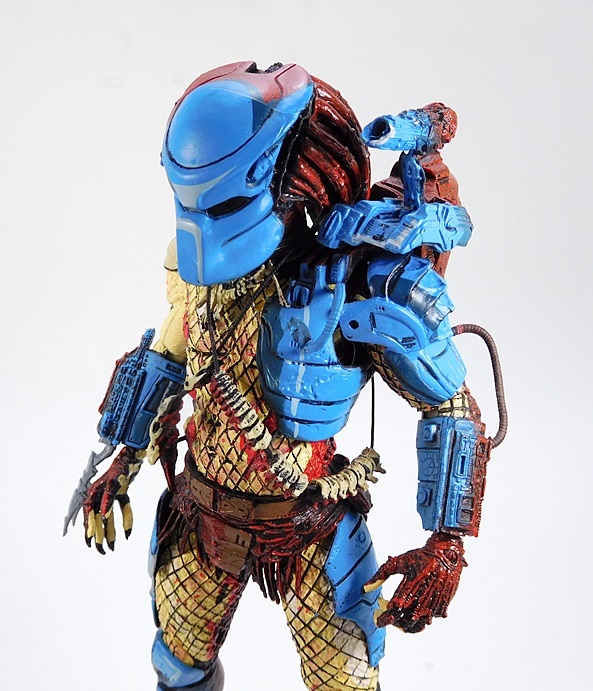 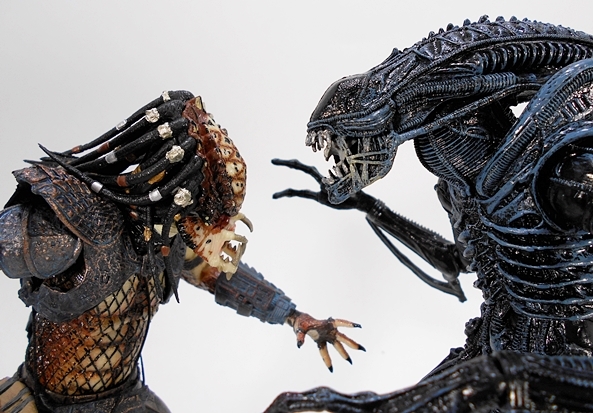 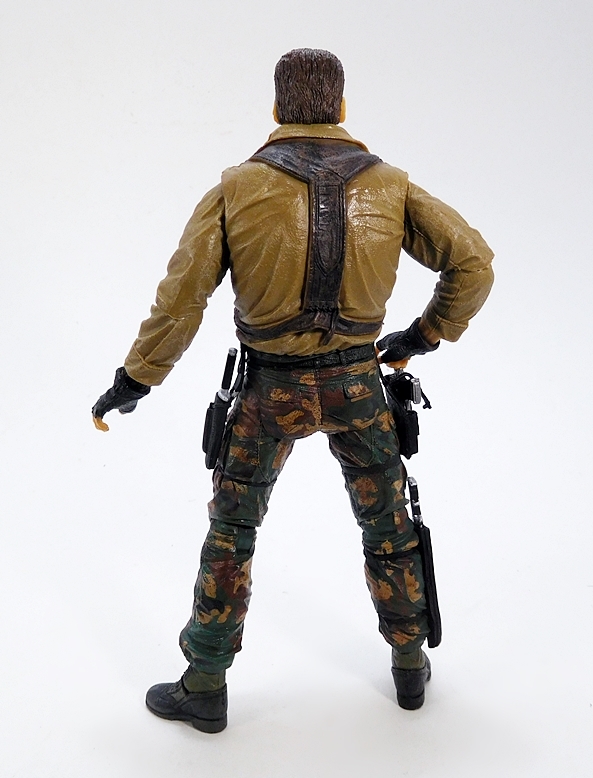 Whatever your personal preferences on Pred designs, it’s hard to deny that NECA really pours the love into these figures and expresses it through some of the finest sculpted detail and paintwork to be found anywhere in this scale. 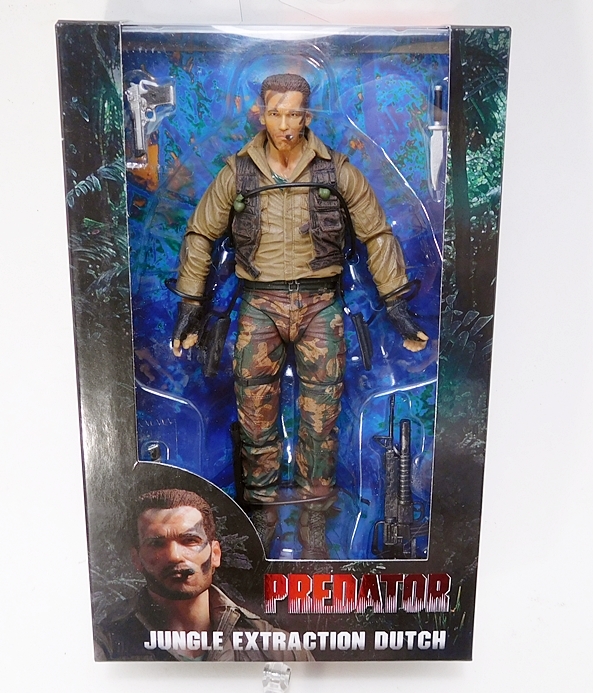 I swear, if you told me that they kept a licensed Predatorologist on retainer, and by that I mean a consultant who has a PhD in Predator culture, I’d totally believe you without a second thought. 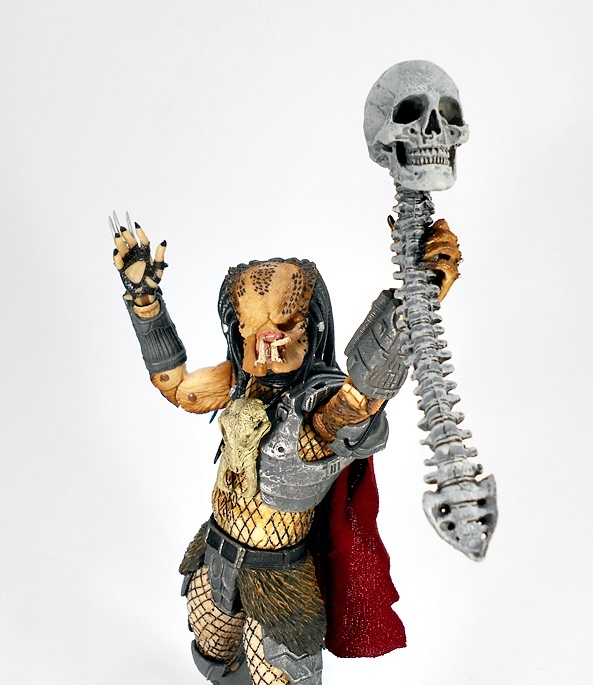 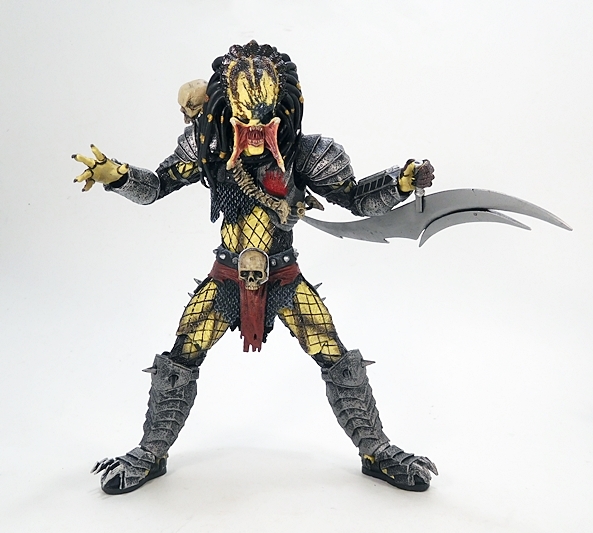 Anyway, there doesn’t look like there are any shared parts between this guy and the other three Preds in my collection, except maybe the hands. 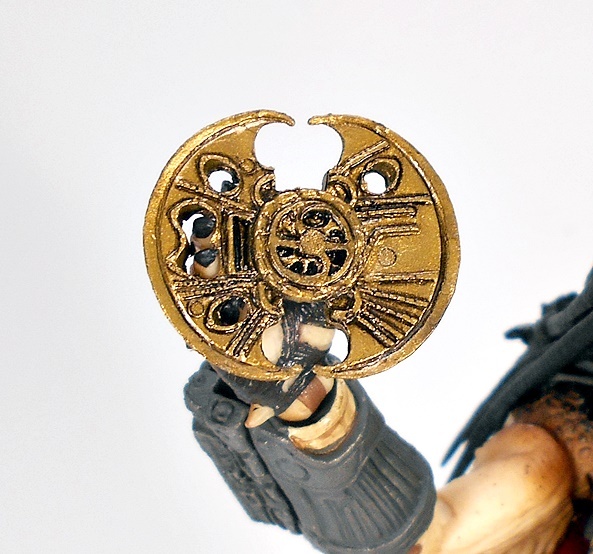 Here’s a little close up of some of that lovely detail. 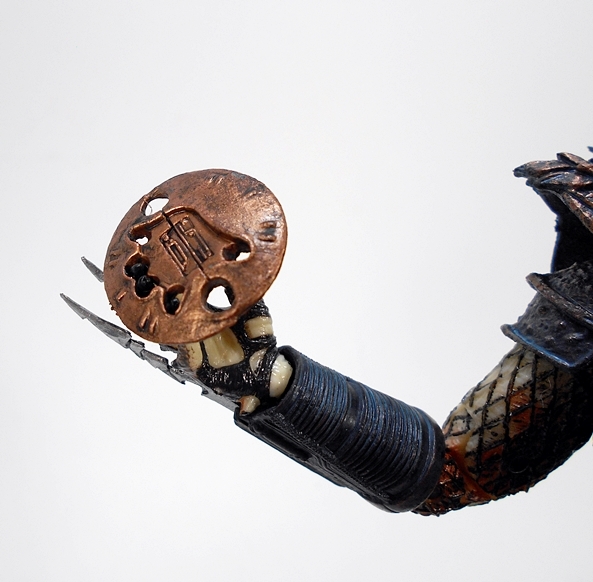 The belt is loaded with various bits of Yautjan gear and implements. 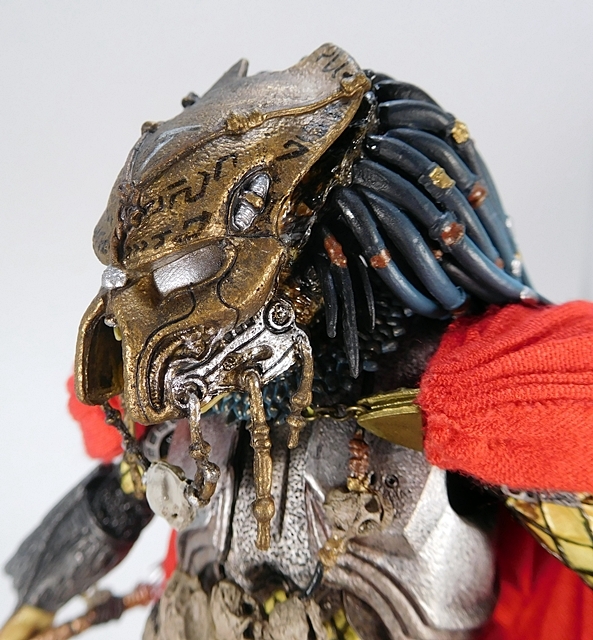 As always, the armor features a wonderful pitted texture to make it look well warn and there’s a paint wash to give it a bit of a rusted patina. 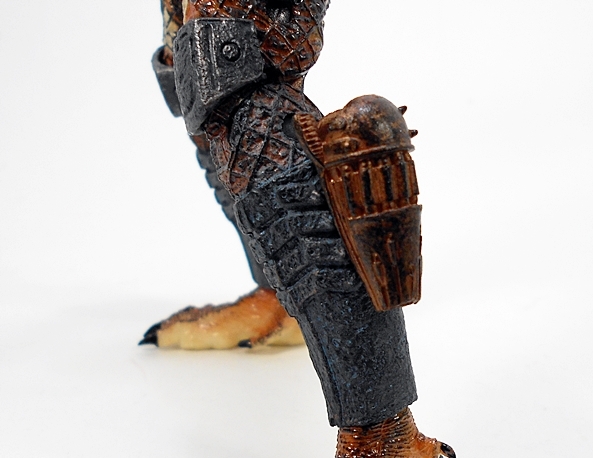 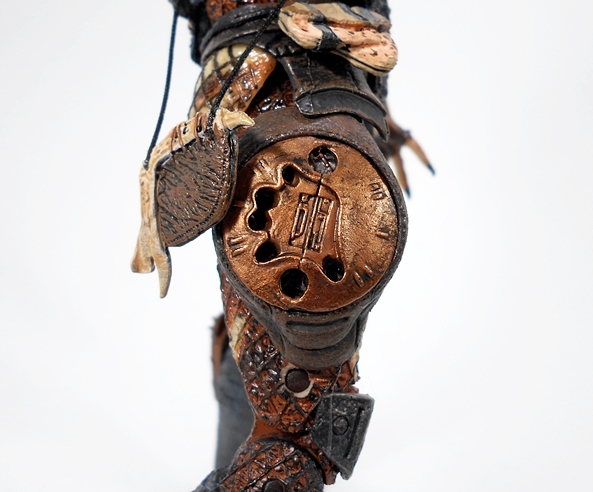 There are plastic straps that secure the segmented thigh armor to his legs, and he has a shoulder strap adorned with trophies across his chest. 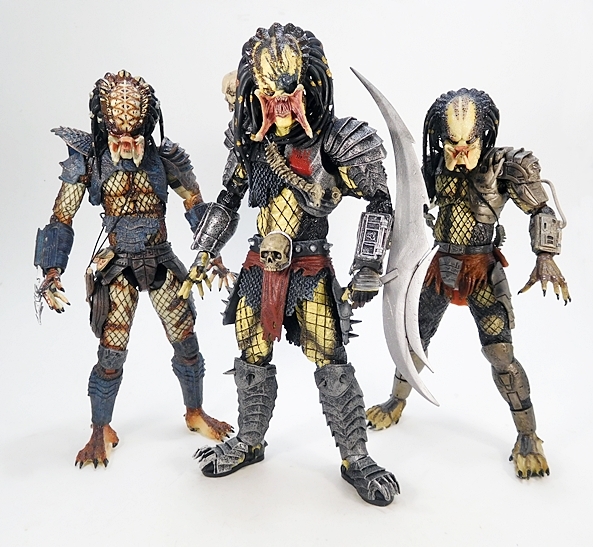 I’ve already worked out in my little head canon, that the bovine looking skull in the middle is from DC’s Red Lantern Skallox, because Elder Predator is so badass that he hunts Red Lanterns. 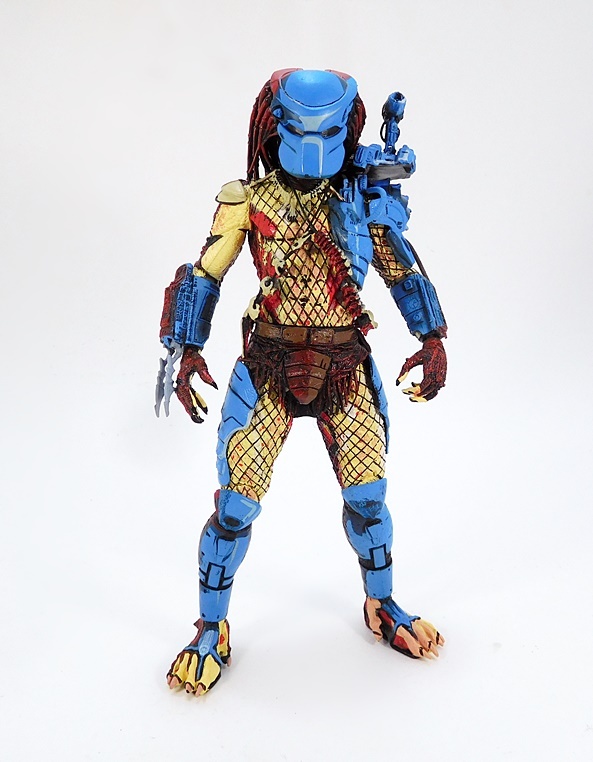 As always, the plastic used for the skin has a slick and semi-transparent look to it, the web suit is sculpted as part of the buck, and all the painted markings on his skin look fabulous. 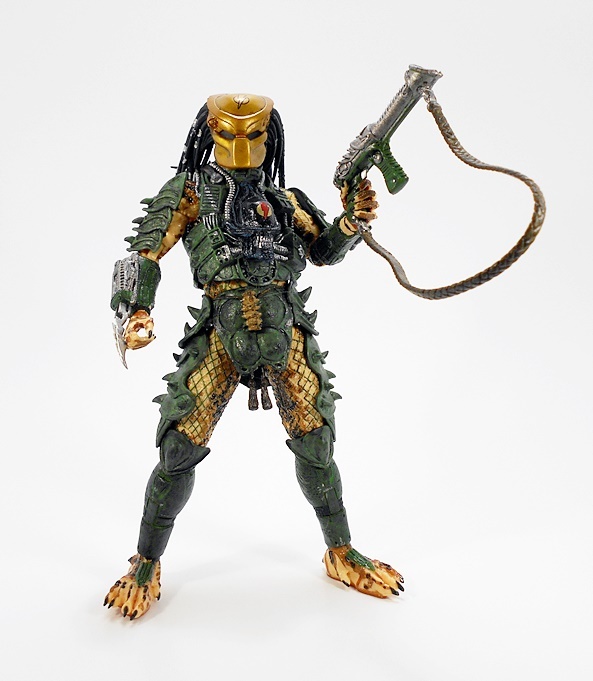 All this, and he sports over 30 points of articulation, including double hinges in the elbows and knees, and a cartload of rotating hinges. 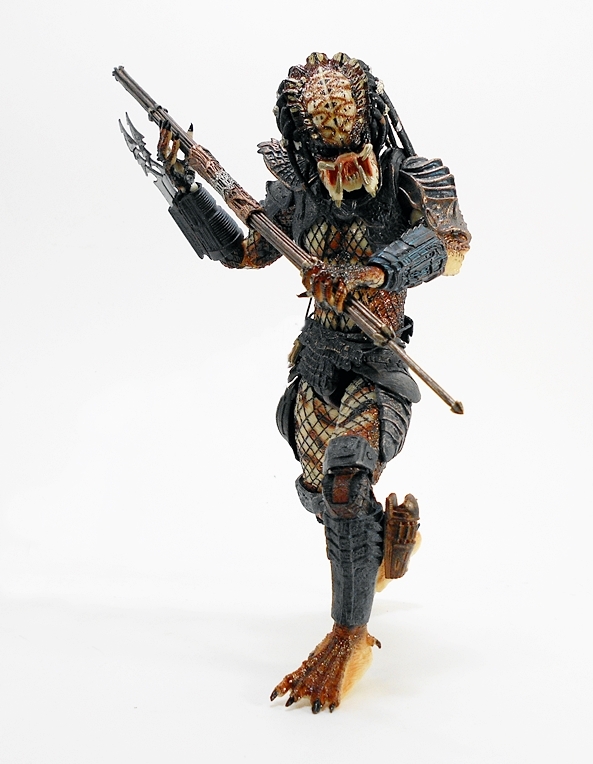 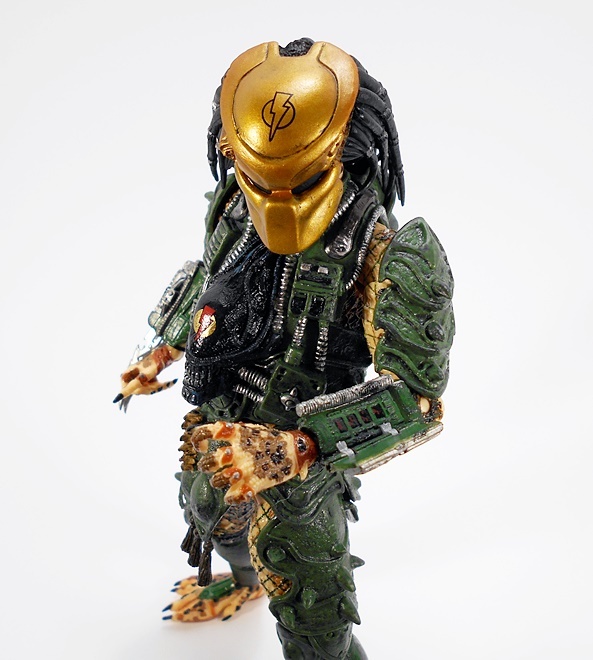 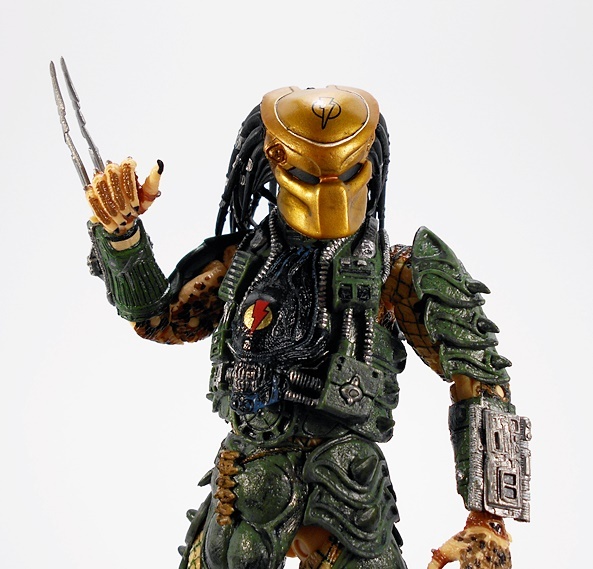 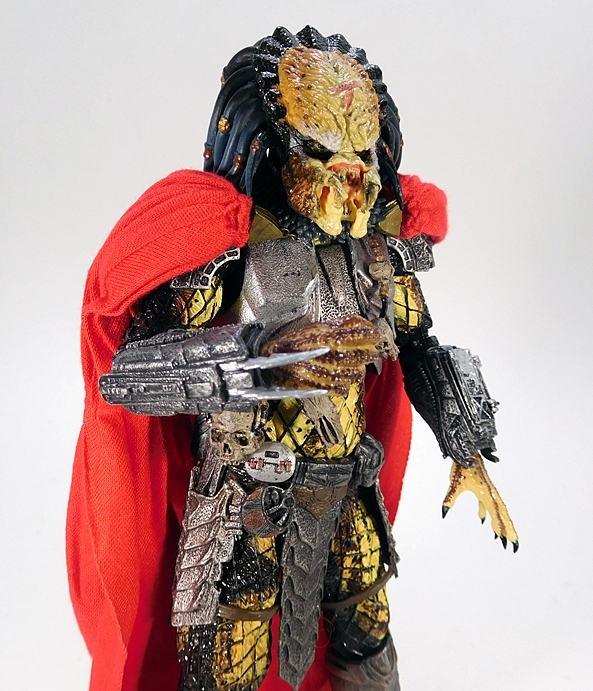 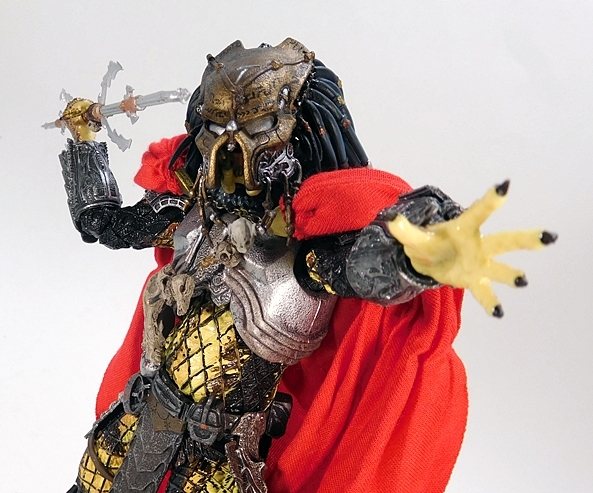 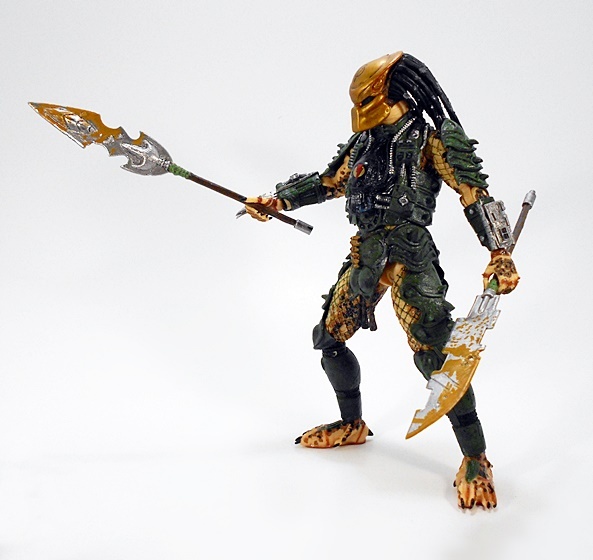 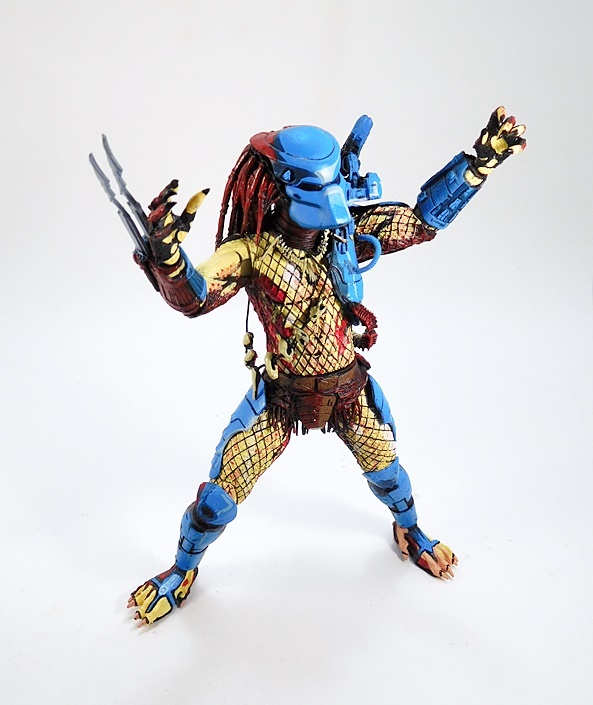 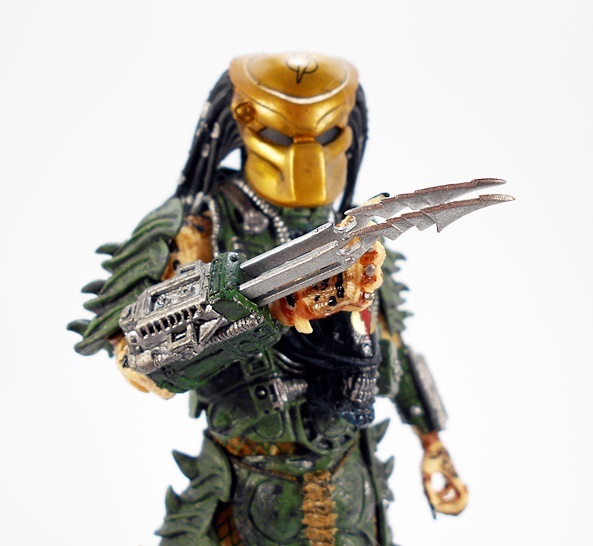 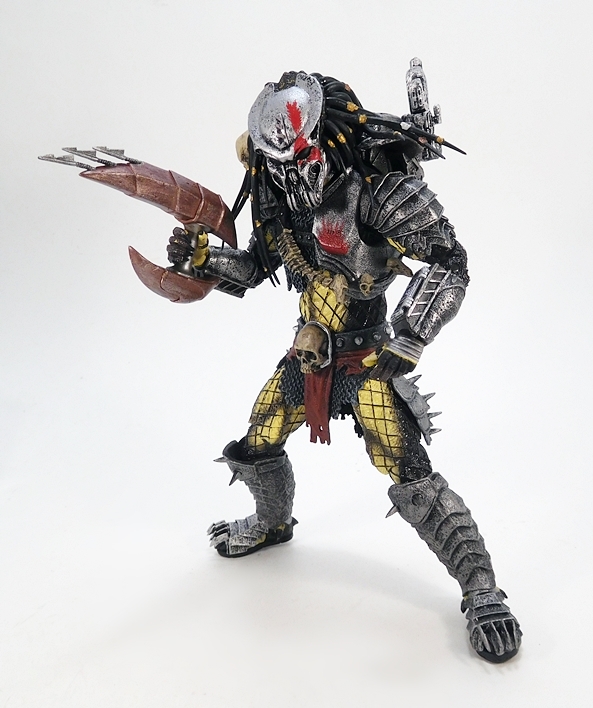 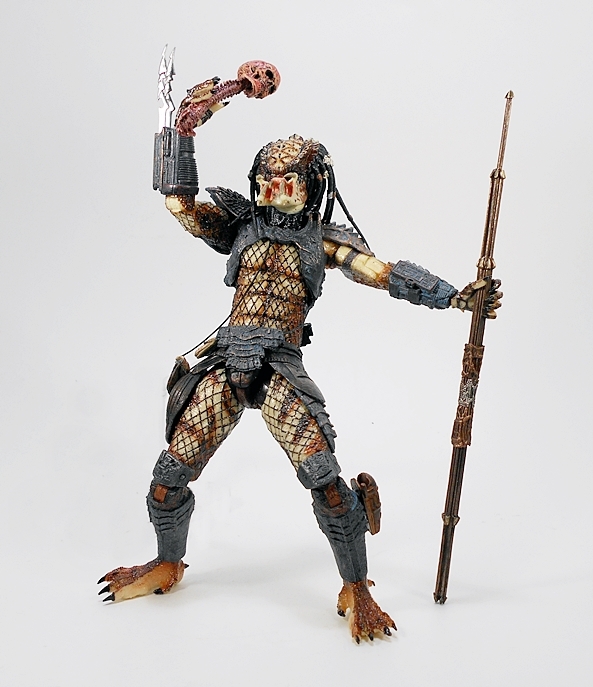 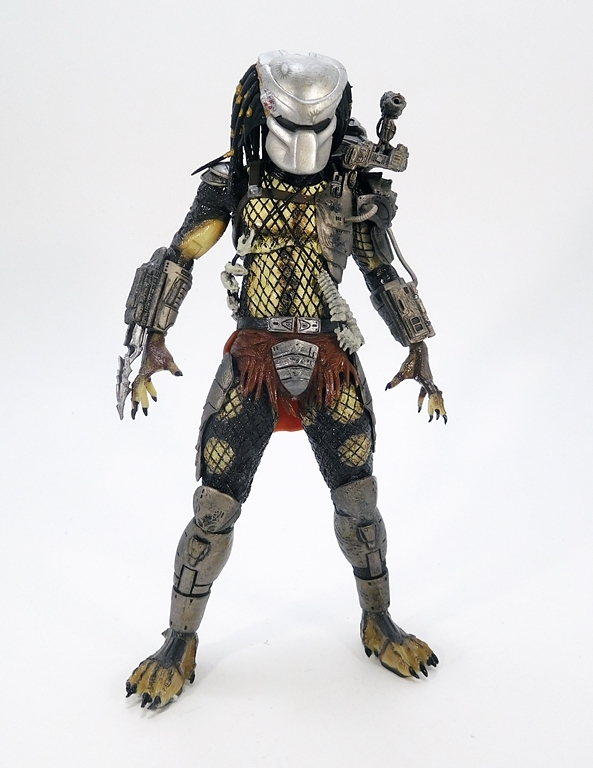 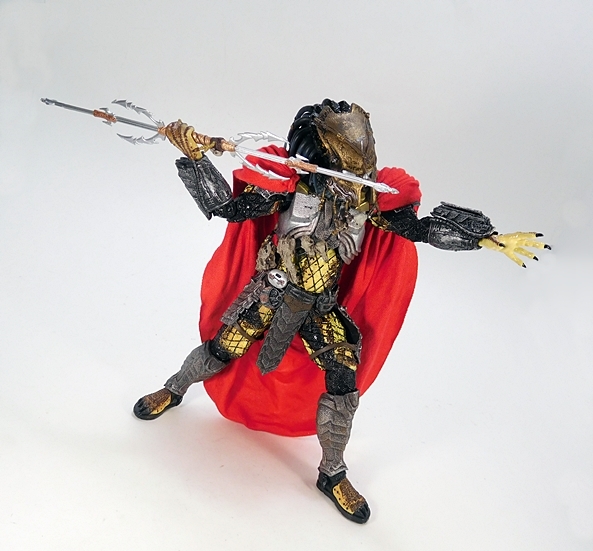 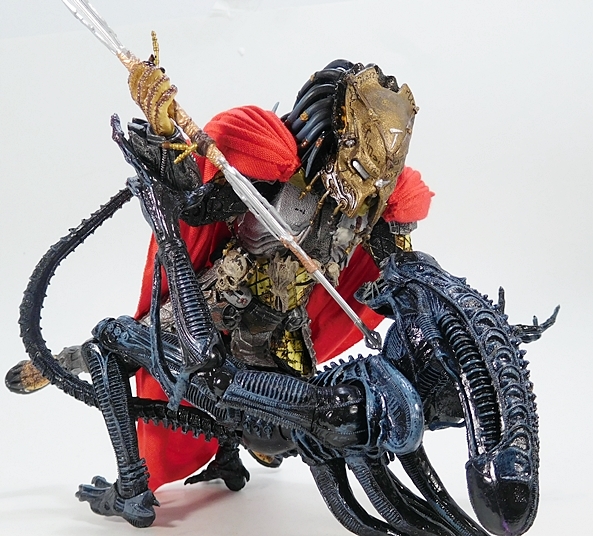 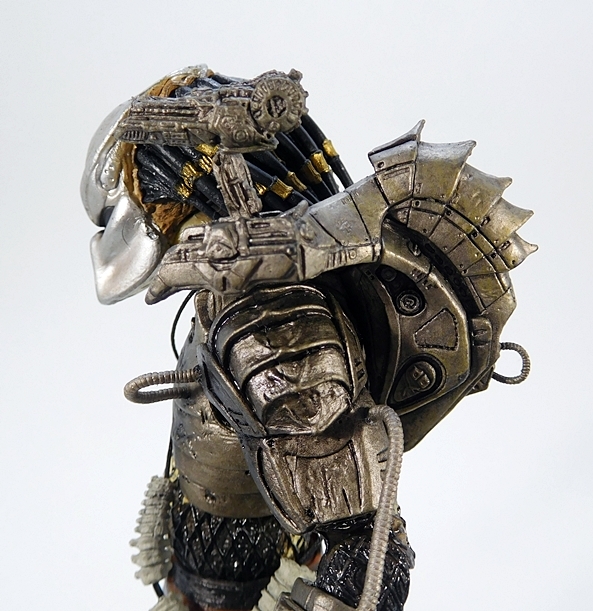 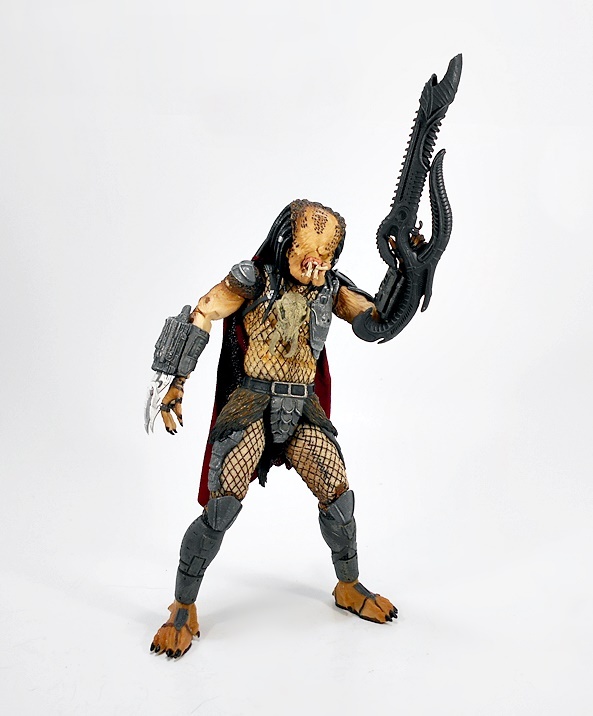 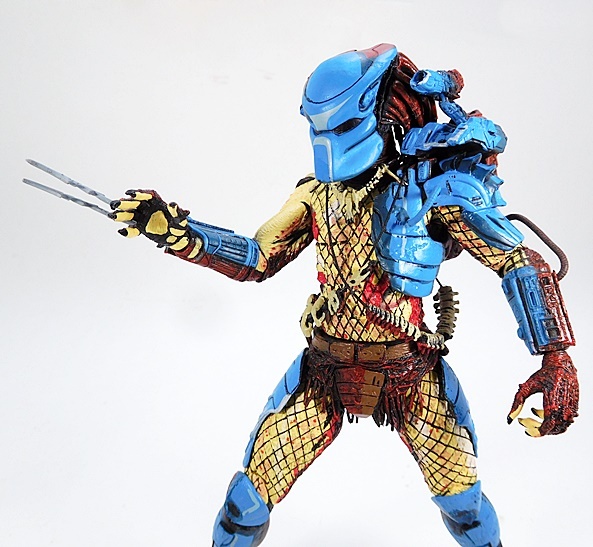 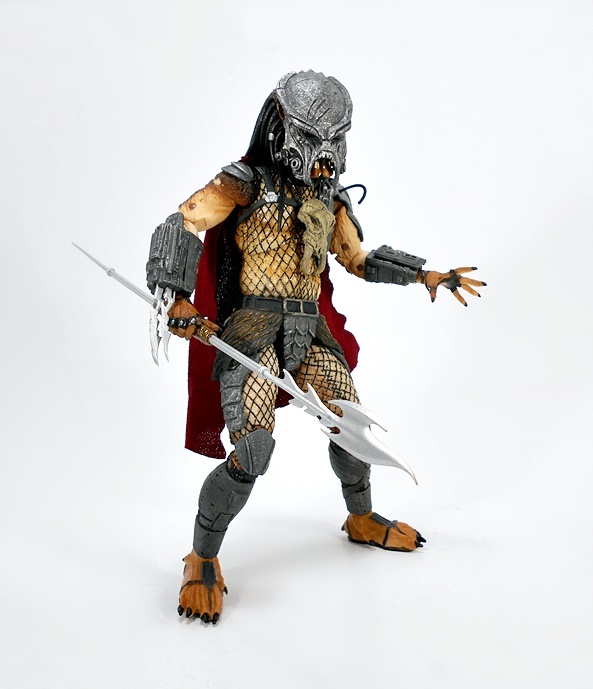 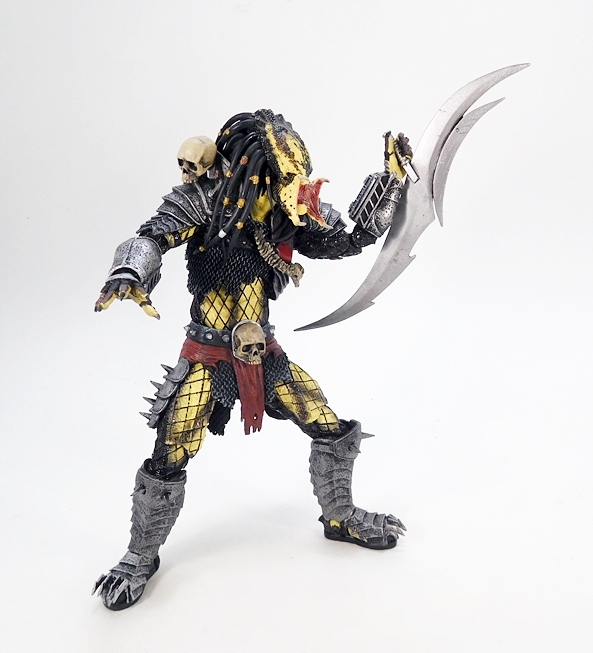 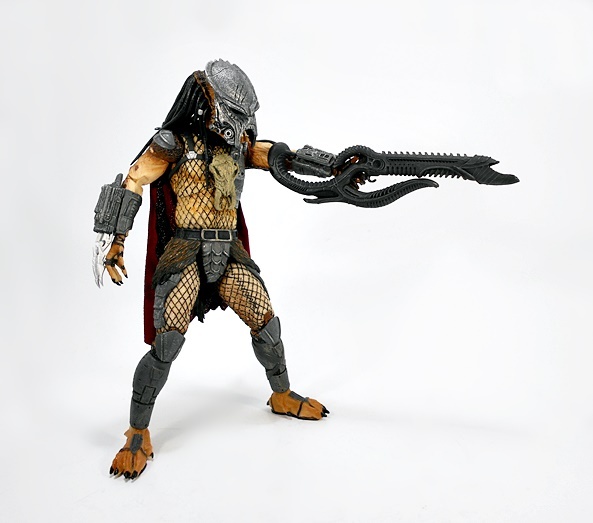 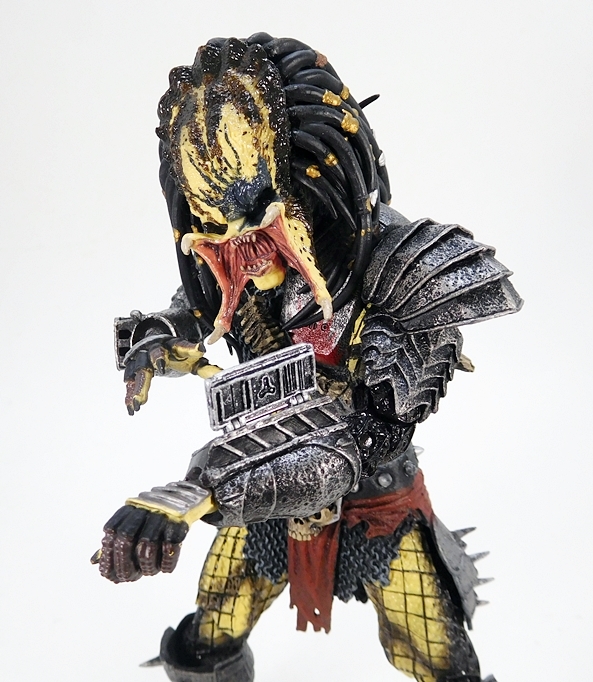 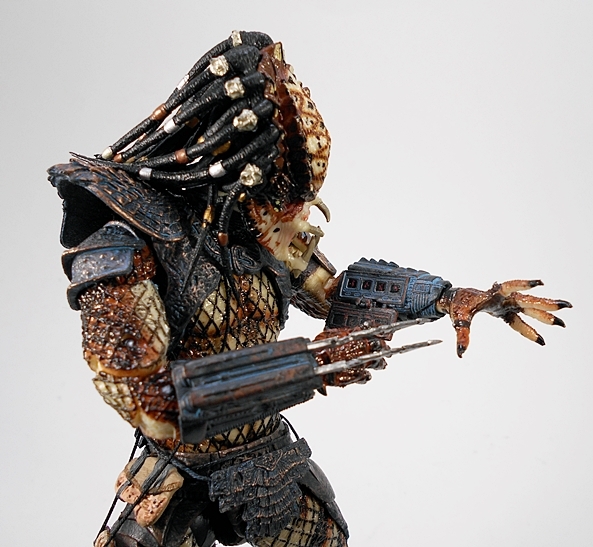 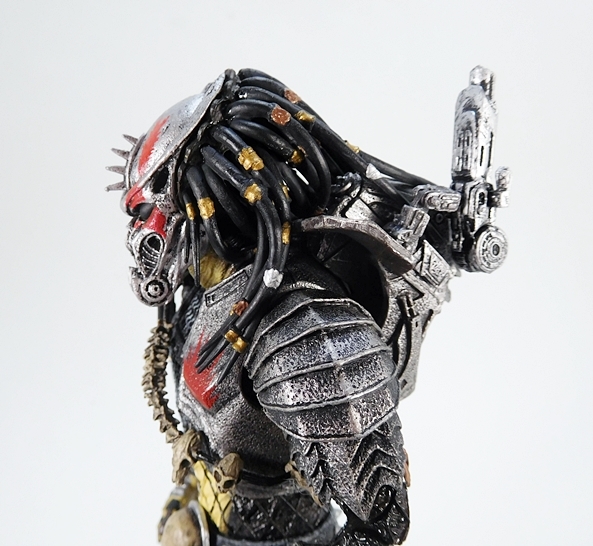 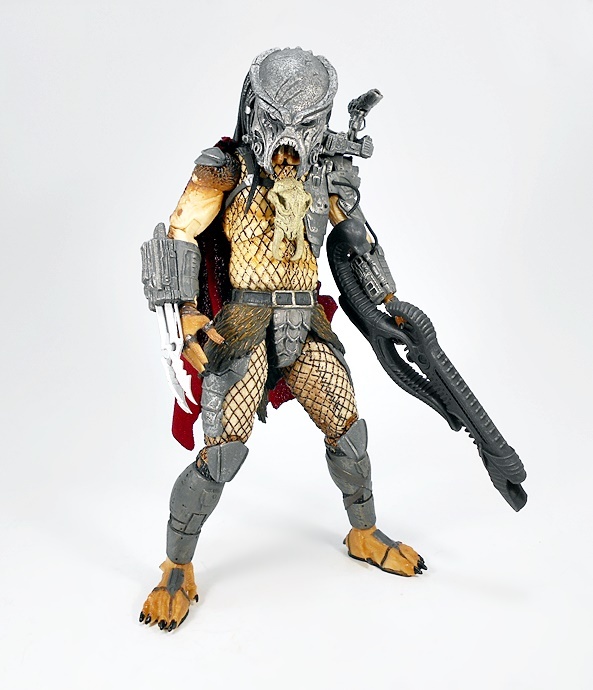 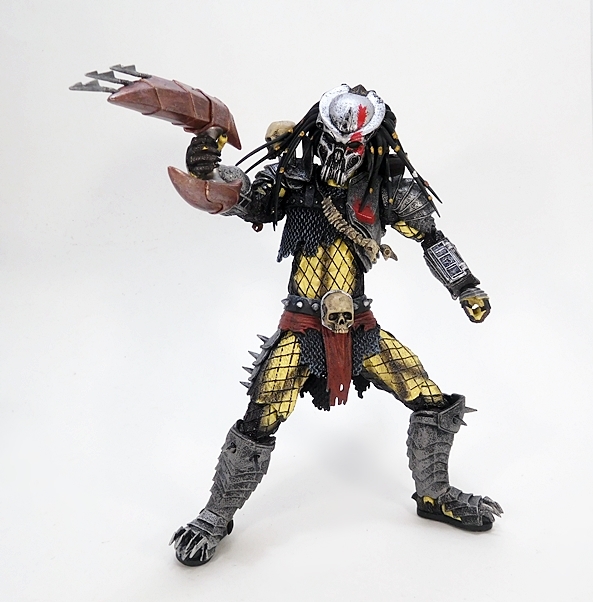 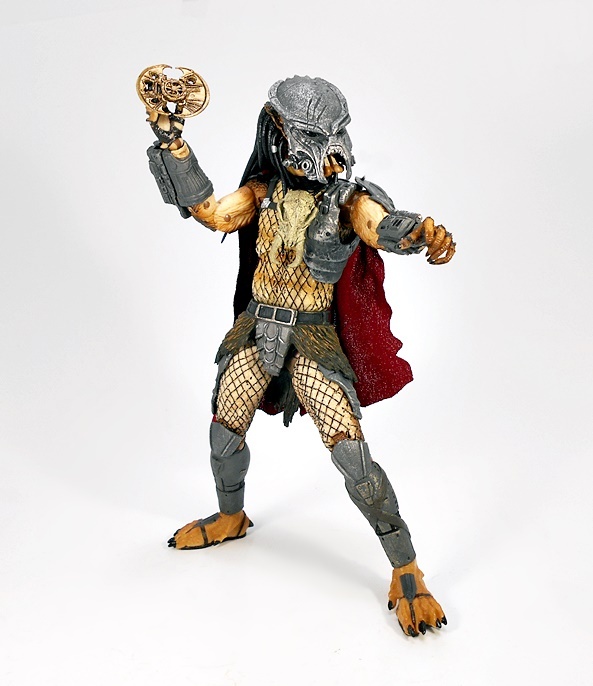 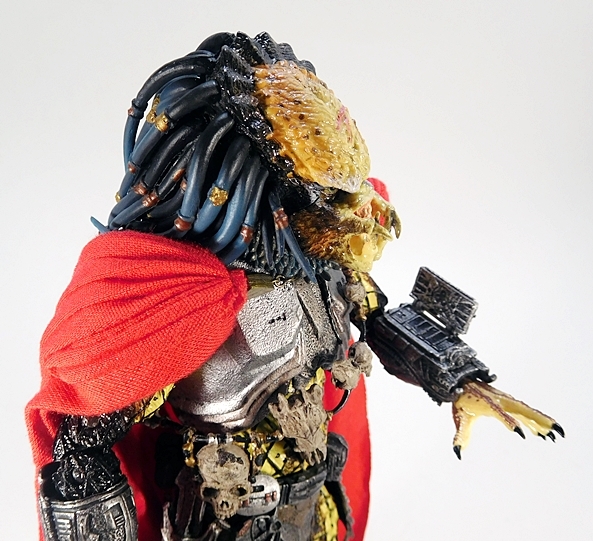 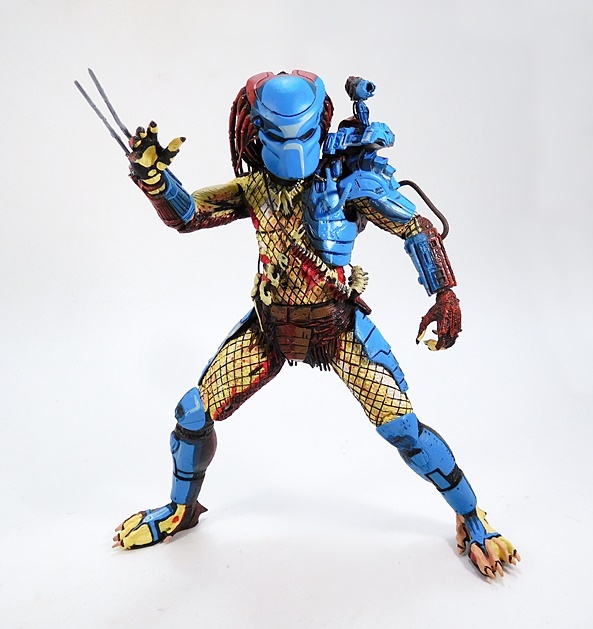 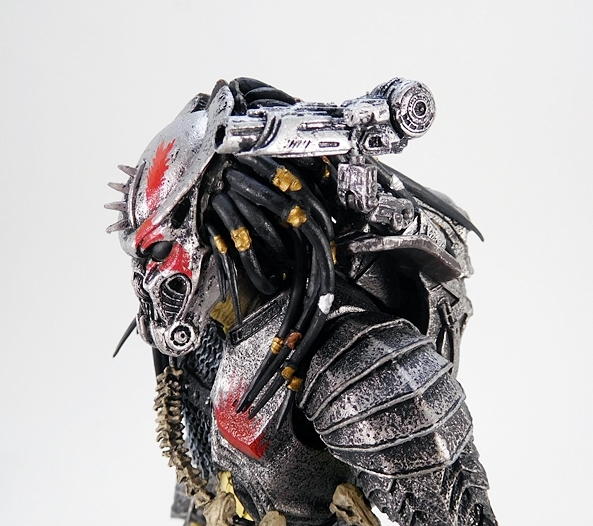 The Elder Predator also features the ubiquitous computer on his left arm and two removable blades for his left arm bracer. 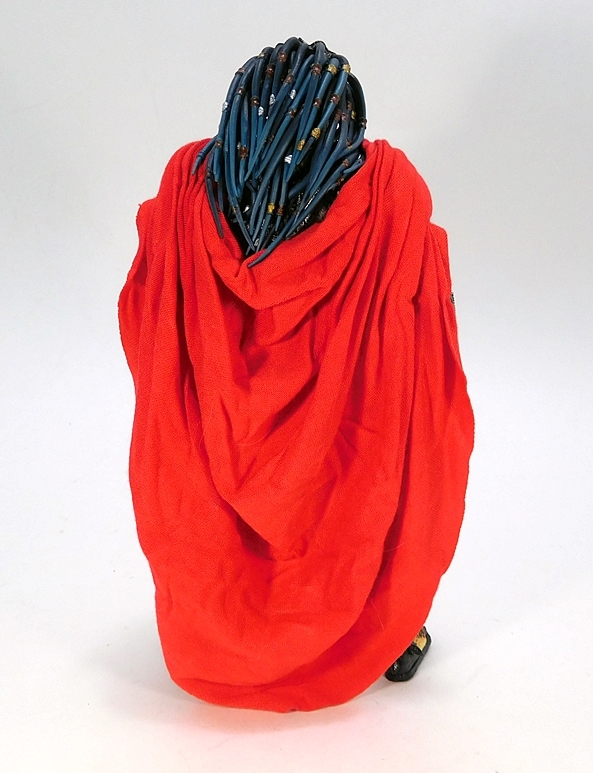 But even with all that lovely detail, I’ll confess that it was the brilliant red cloth cape that got me to do a double take and pick the Elder up off the shelf. 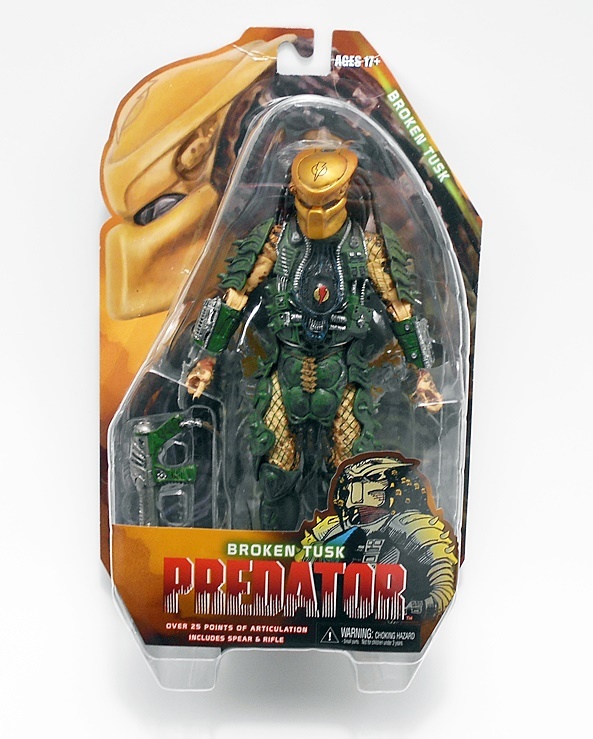 It really makes him stand out in the sea of other Preds on the shelves. 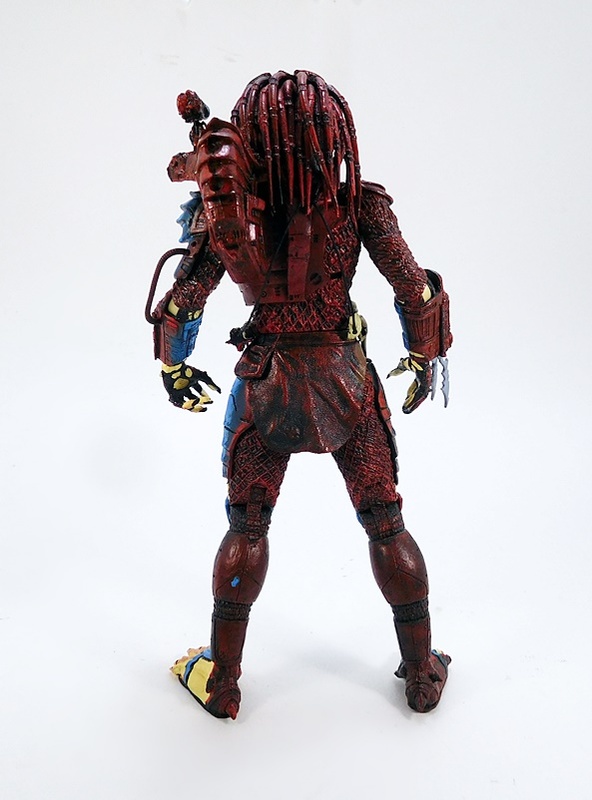 And not to be content with just hanging a rectangle piece of red cloth on him, NECA created a beautifully tailored garment that hangs off his neck on an ornamental chain. 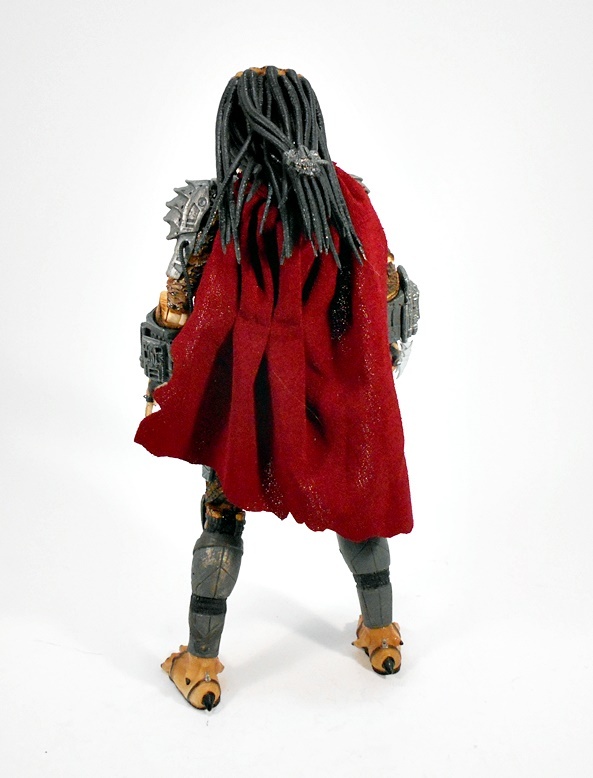 It sits beautifully on his shoulders and just check out the way it cascades down his back, dipping behind the neck so as not to cover up his glorious dreads. 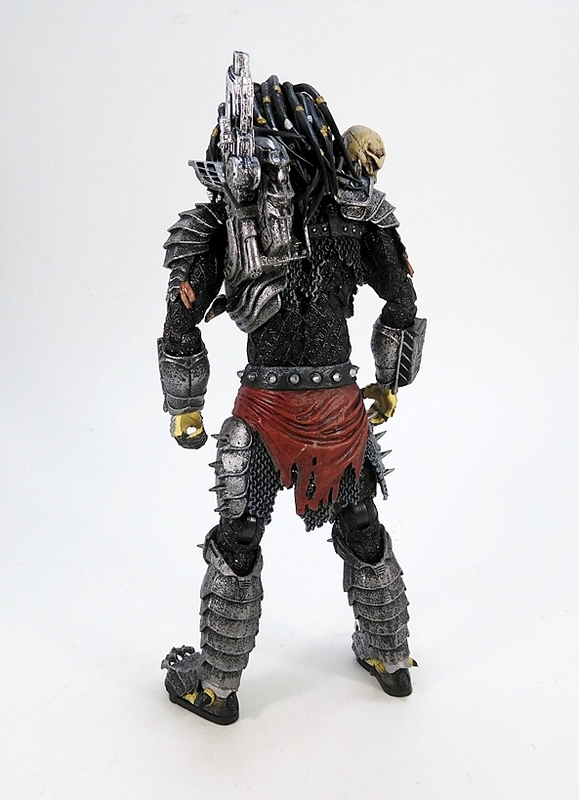 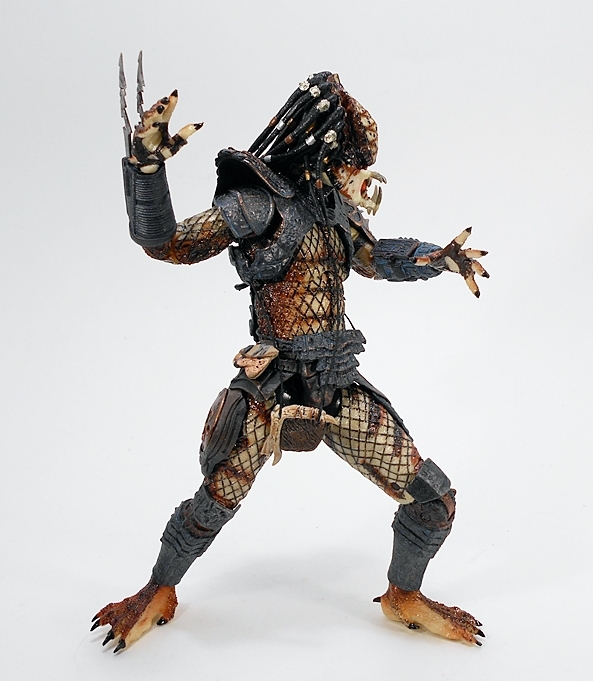 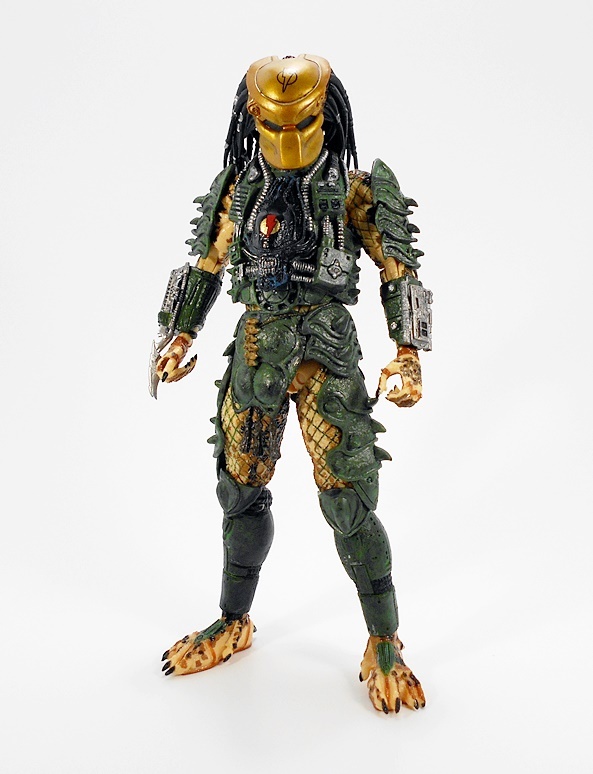 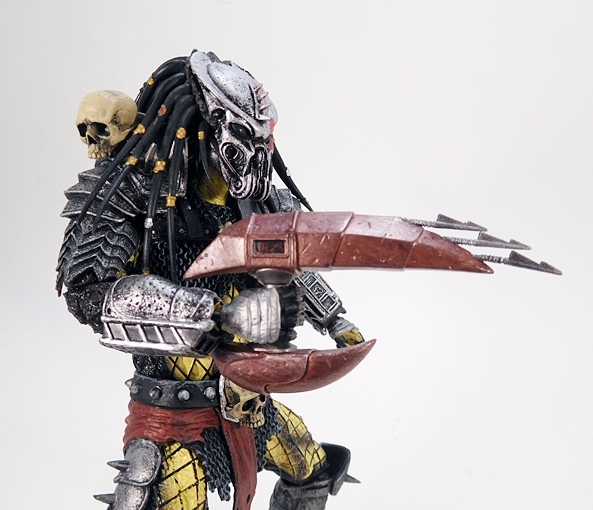 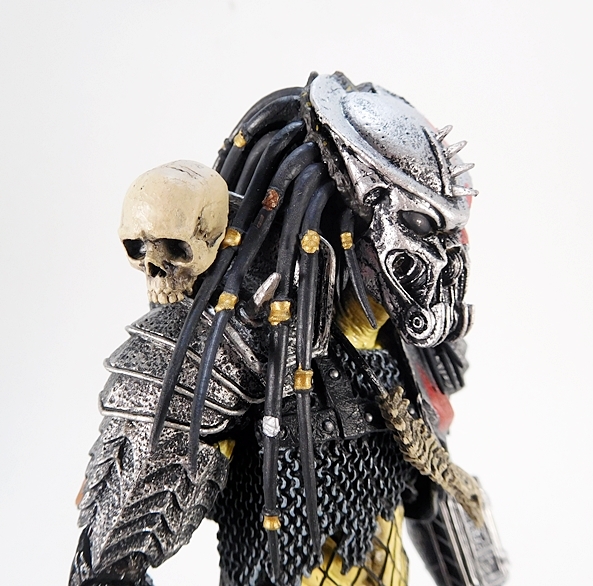 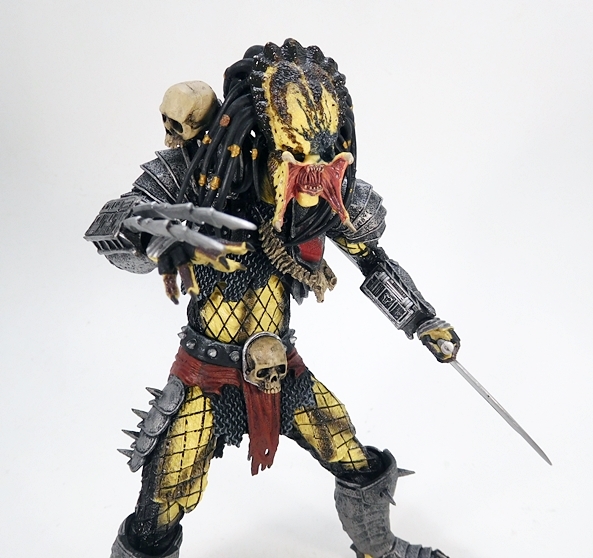 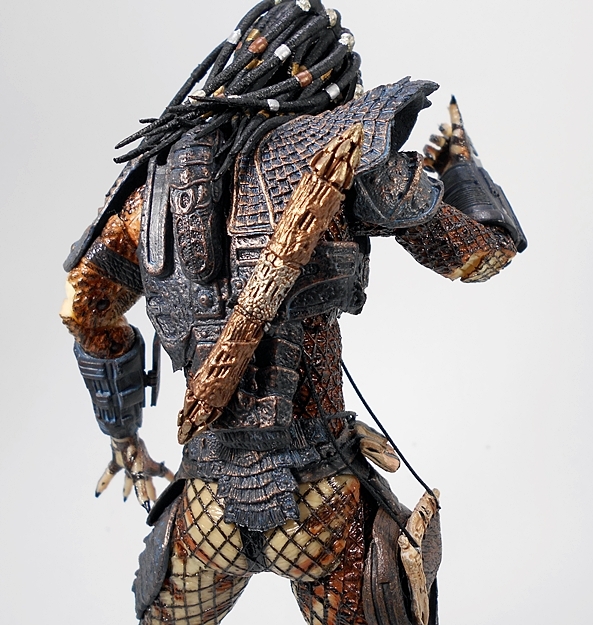 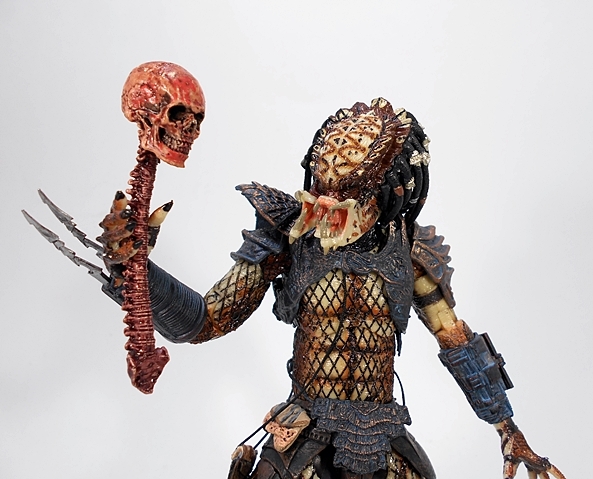 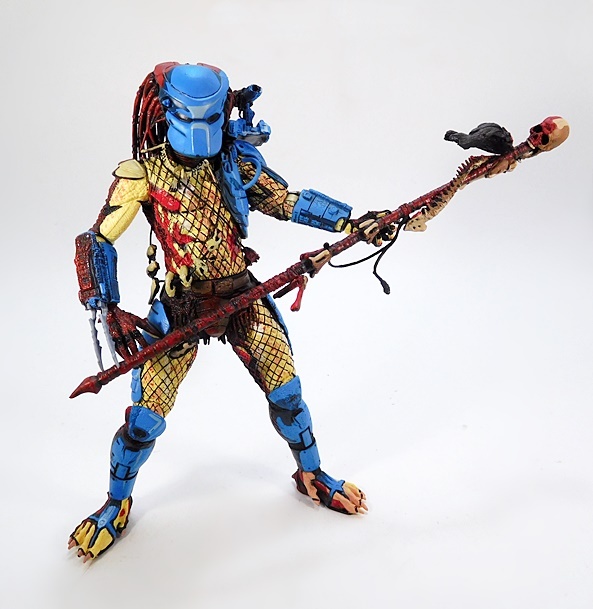 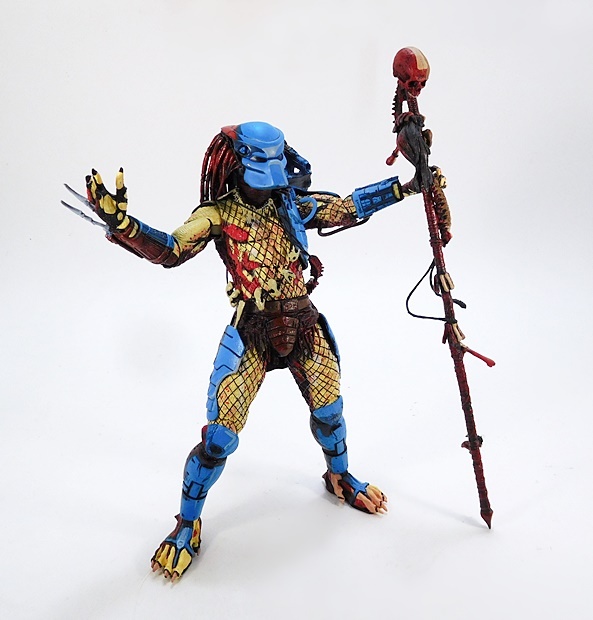 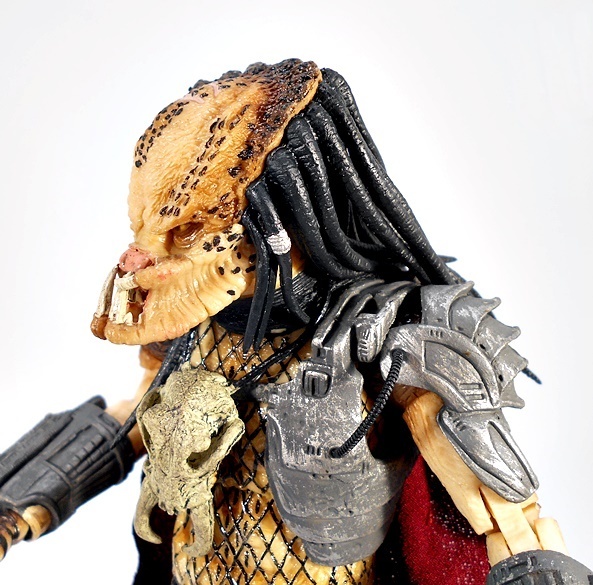 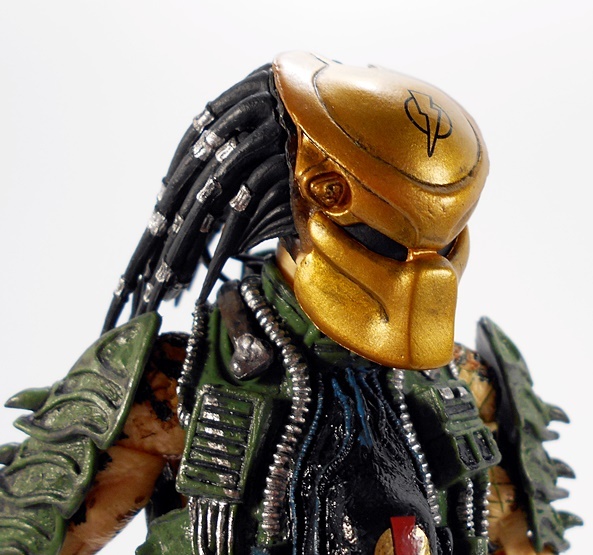 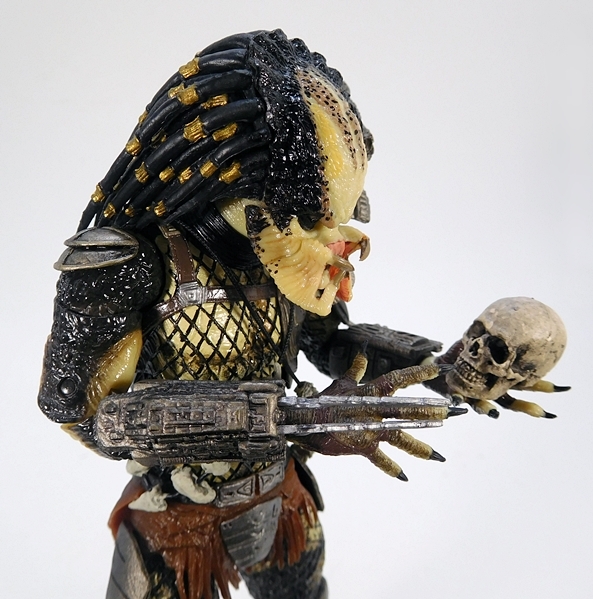 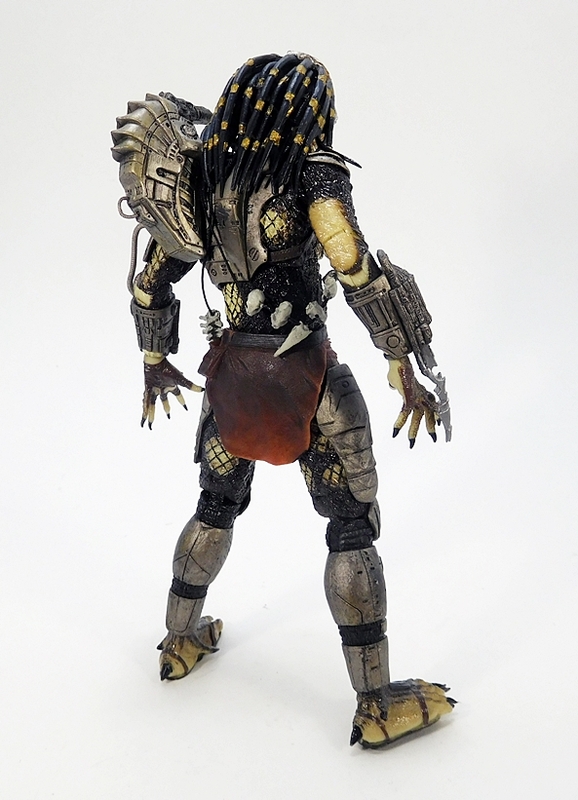 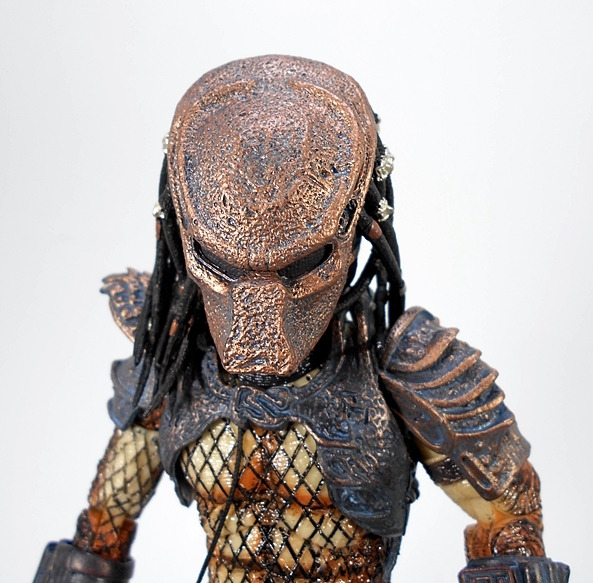 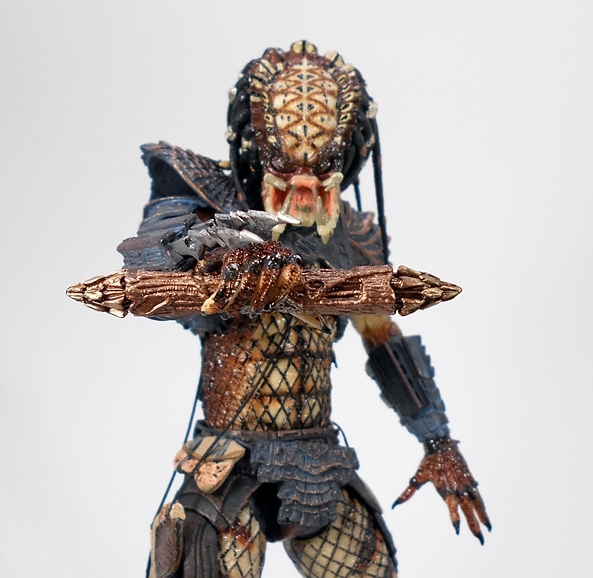 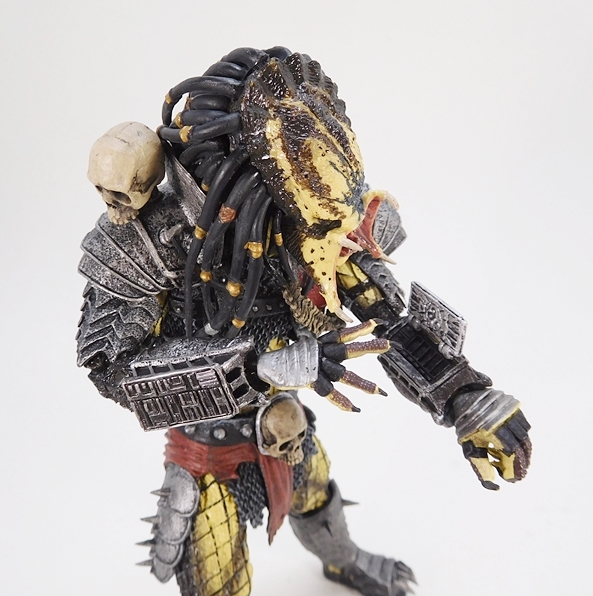 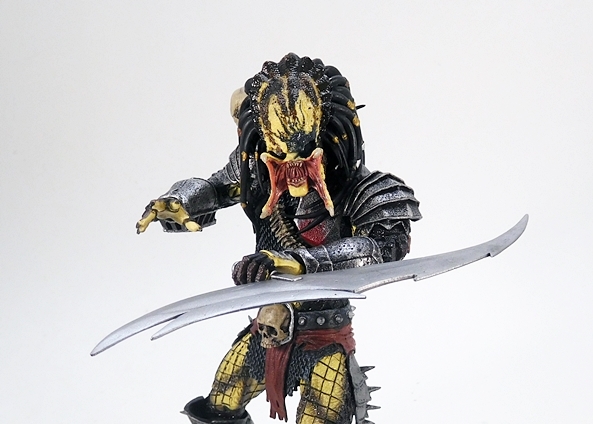 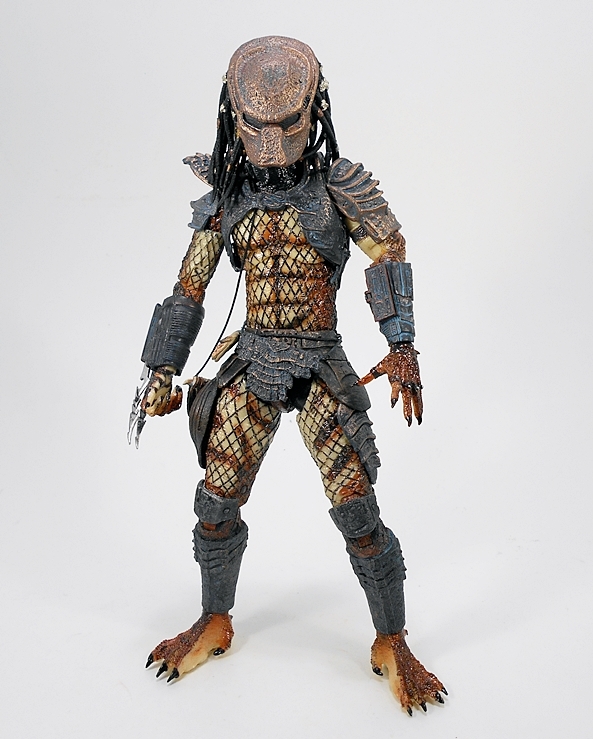 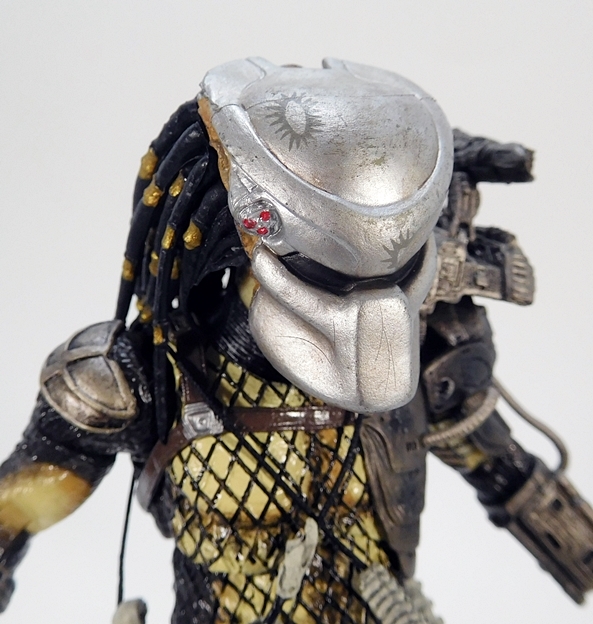 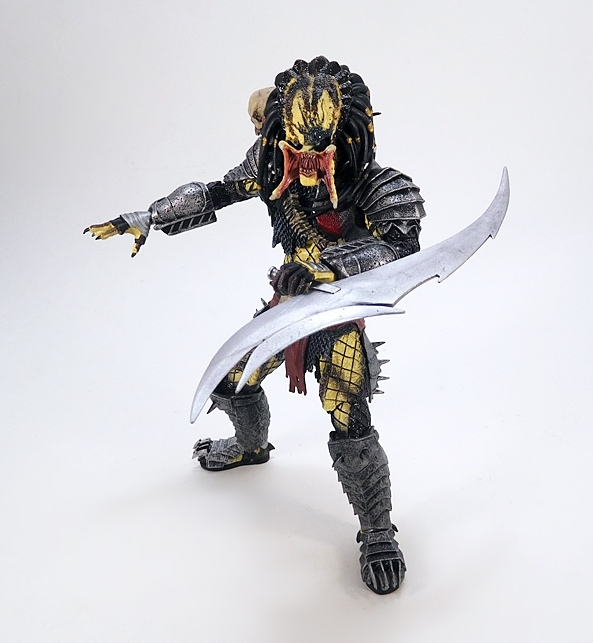 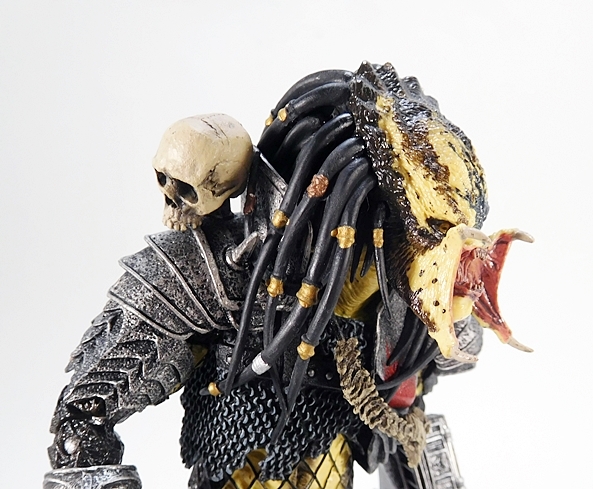 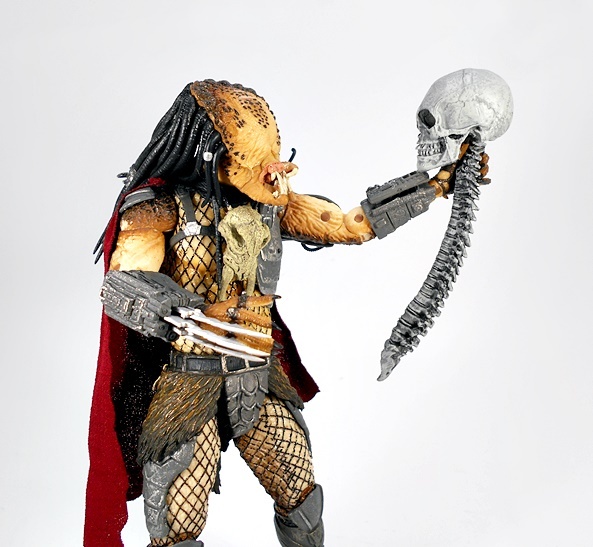 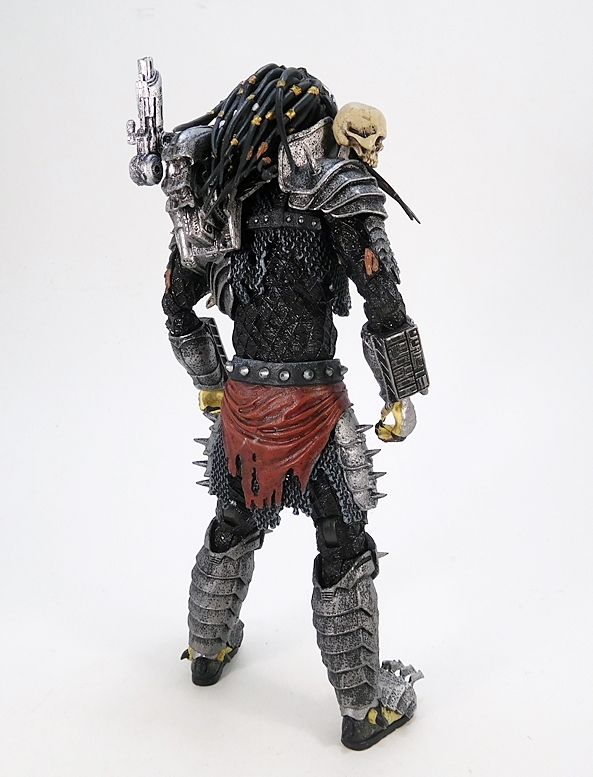 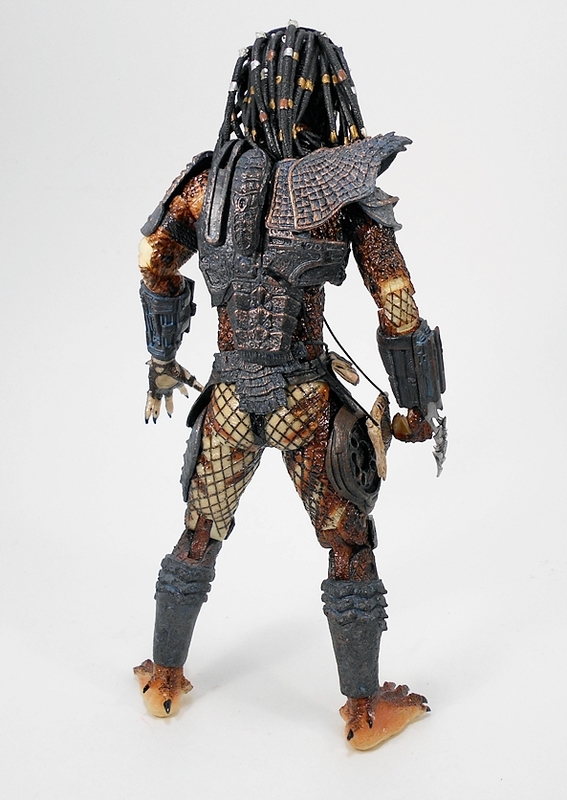 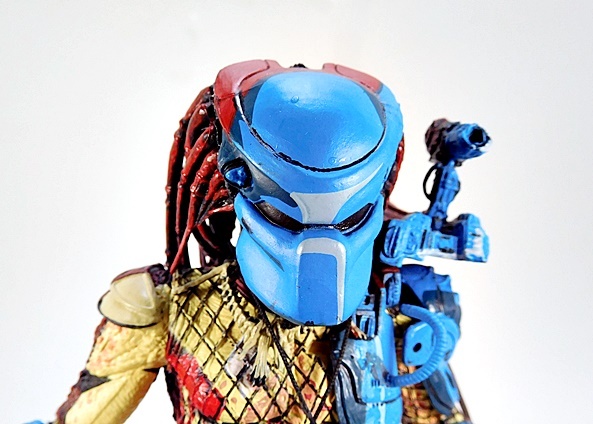 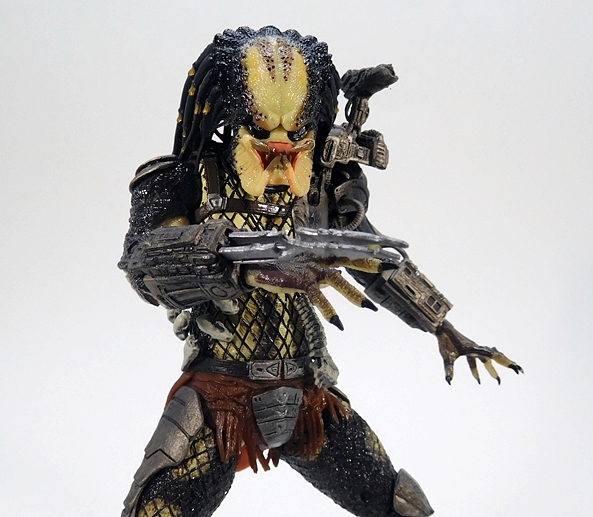 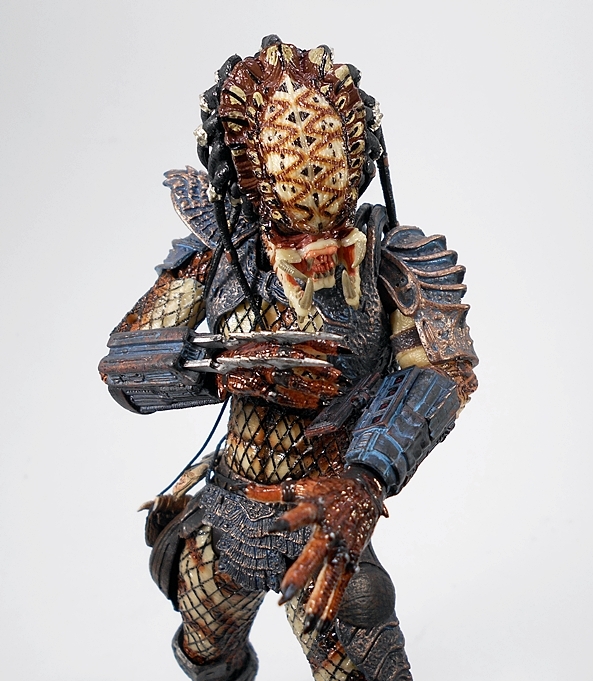 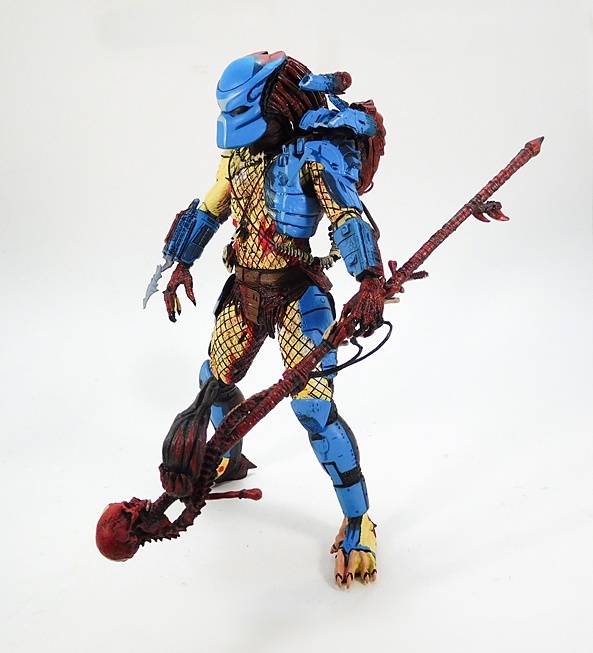 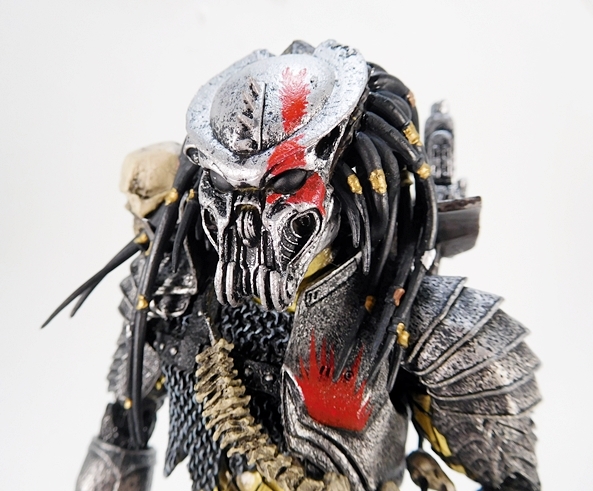 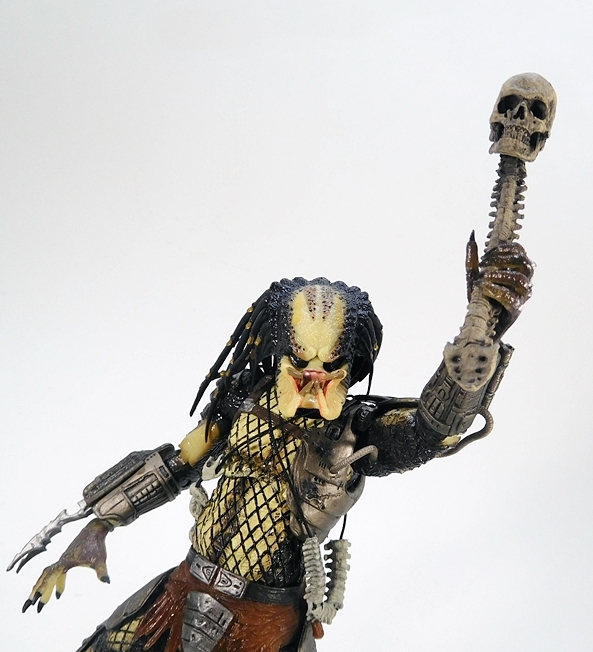 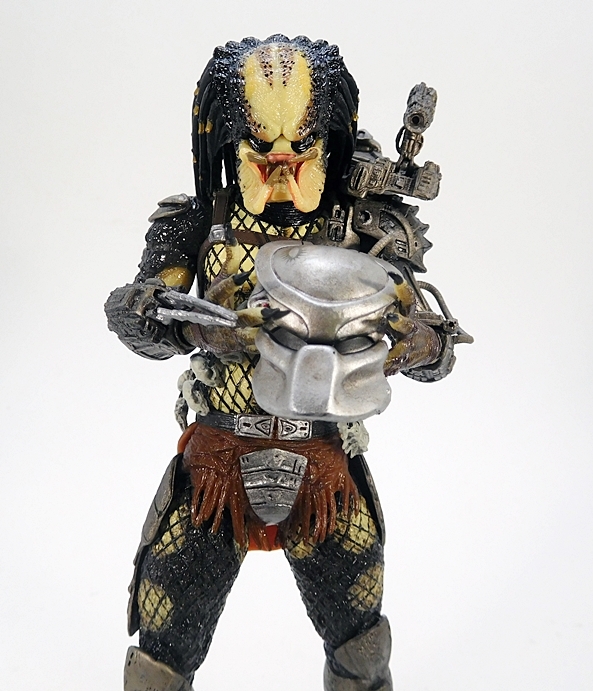 Speaking of dreads, the individually sculpted and painted dreadlocks remain one of my favorite things about NECA’s Predator head sculpts. 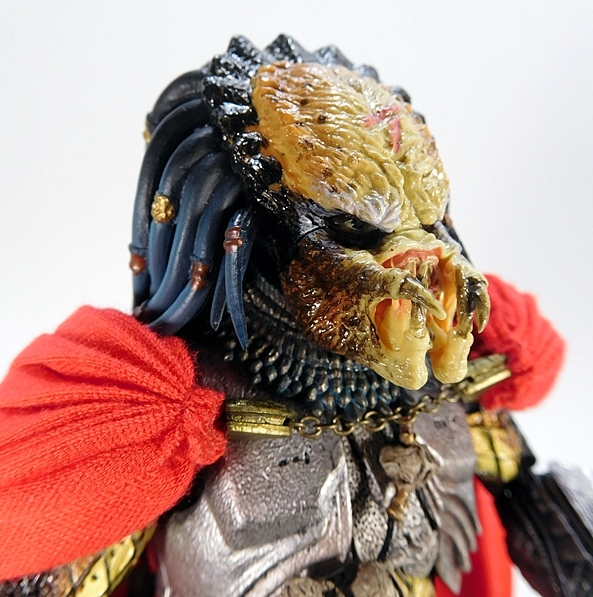 That’s not to take away anything from the rest of the portrait, because it truly is superb. 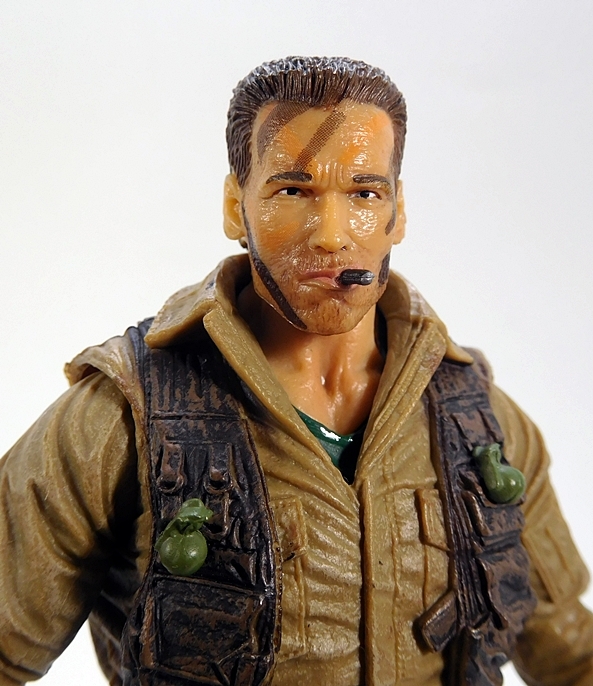 The deep set eyes are perfectly painted, which makes me wonder how they can get in there to paint those eyes straight when Hasbro has a tough time doing it on regular human figures. 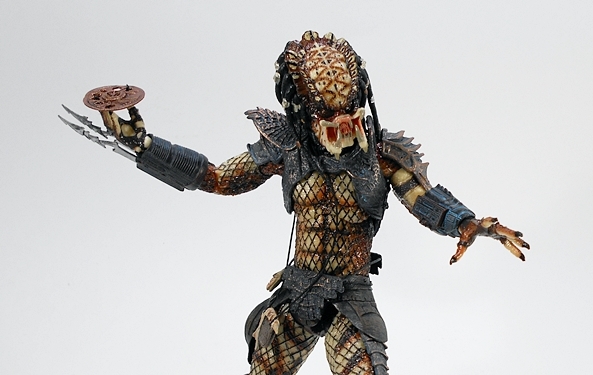 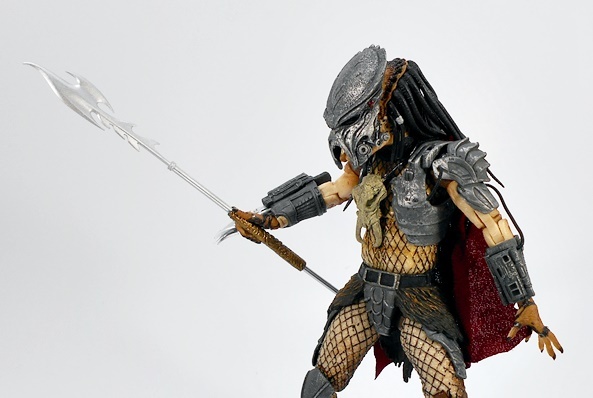 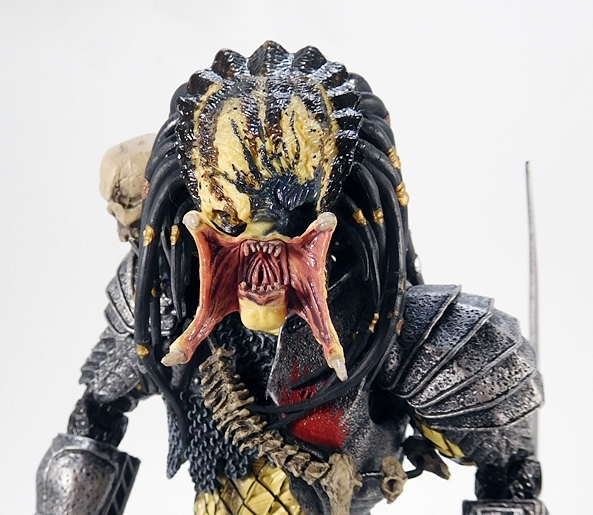 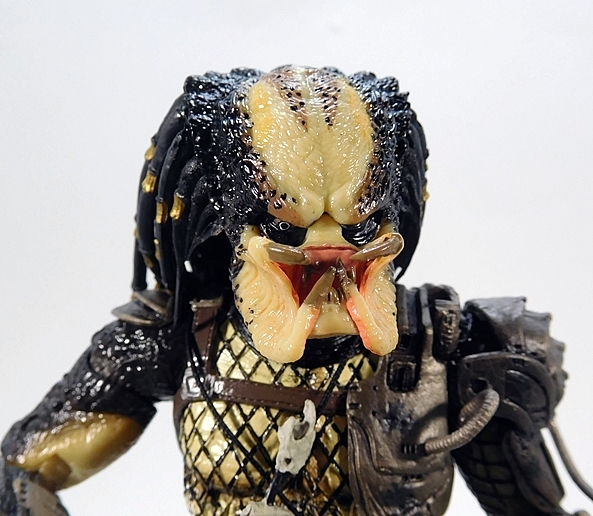 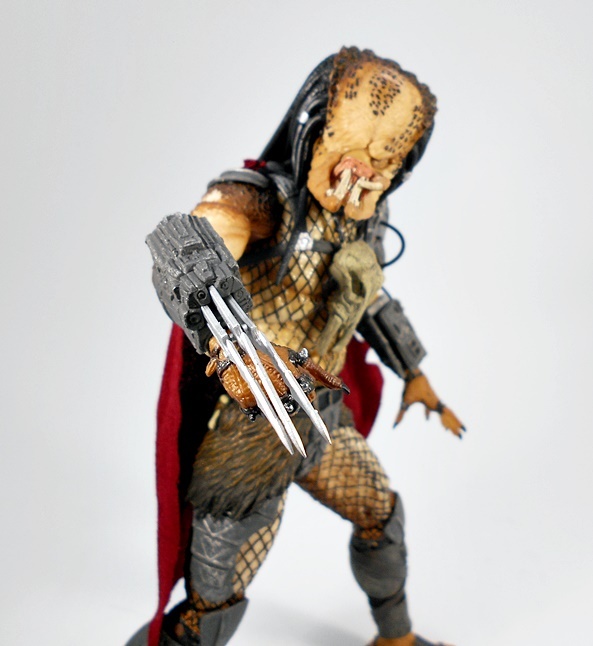 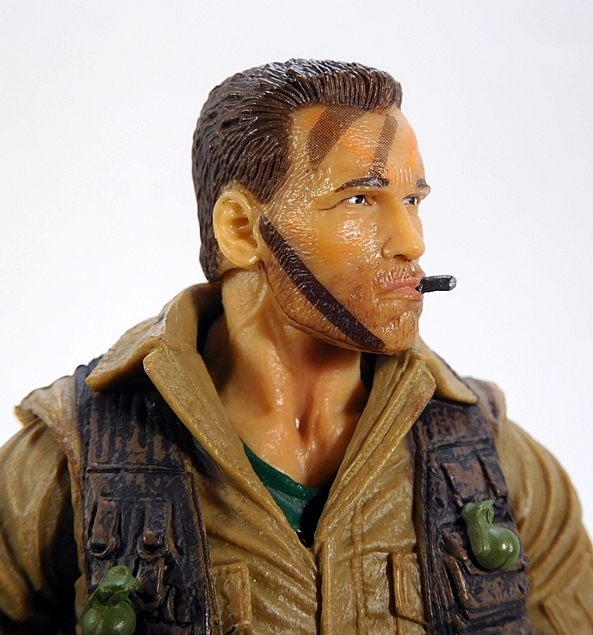 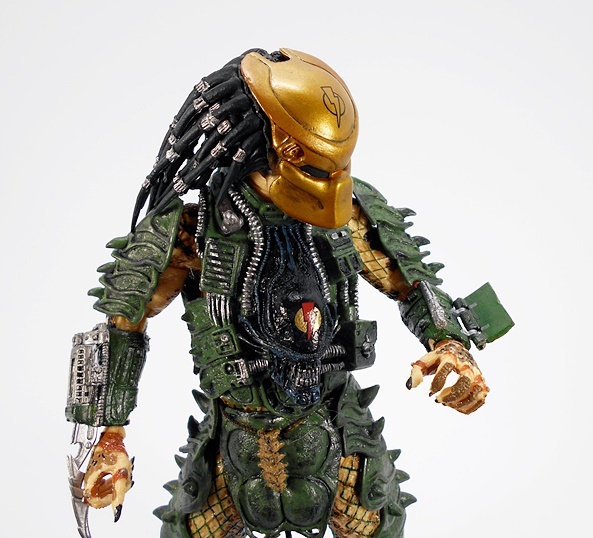 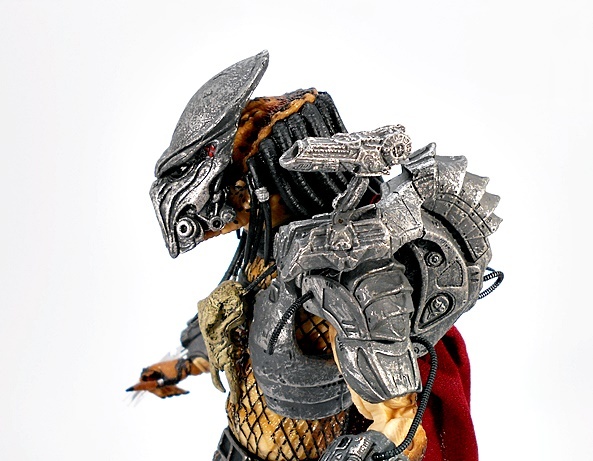 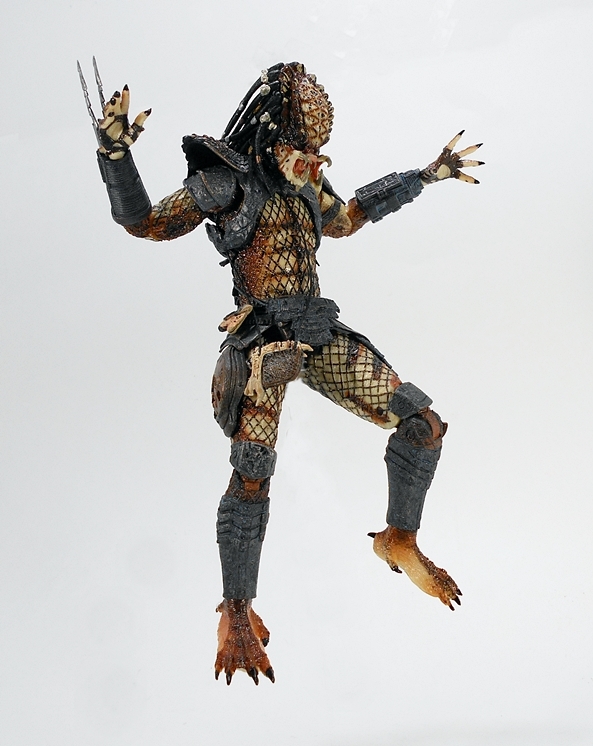 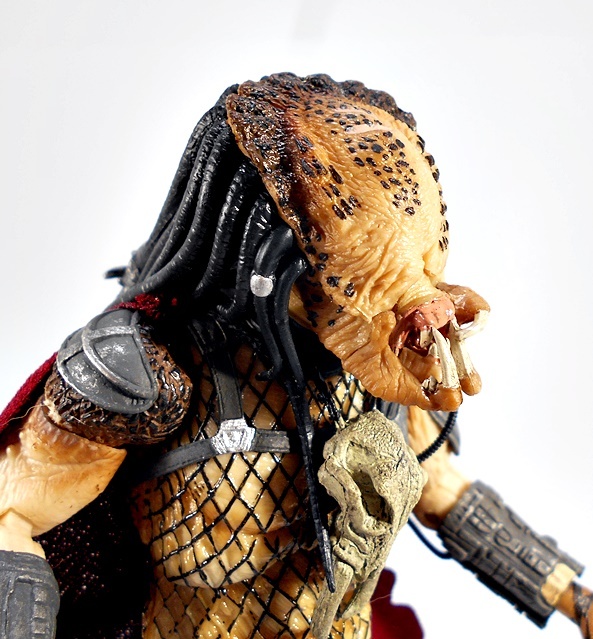 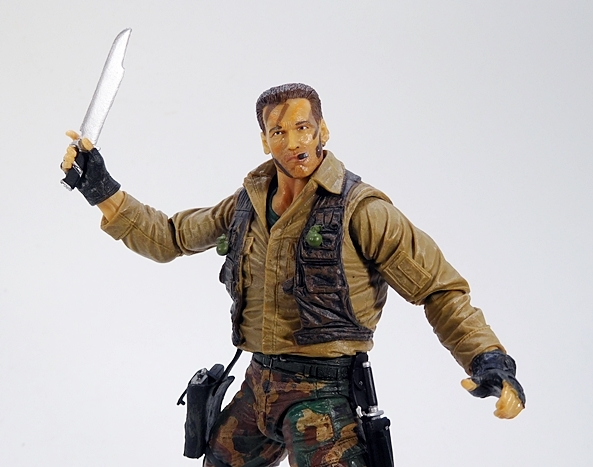 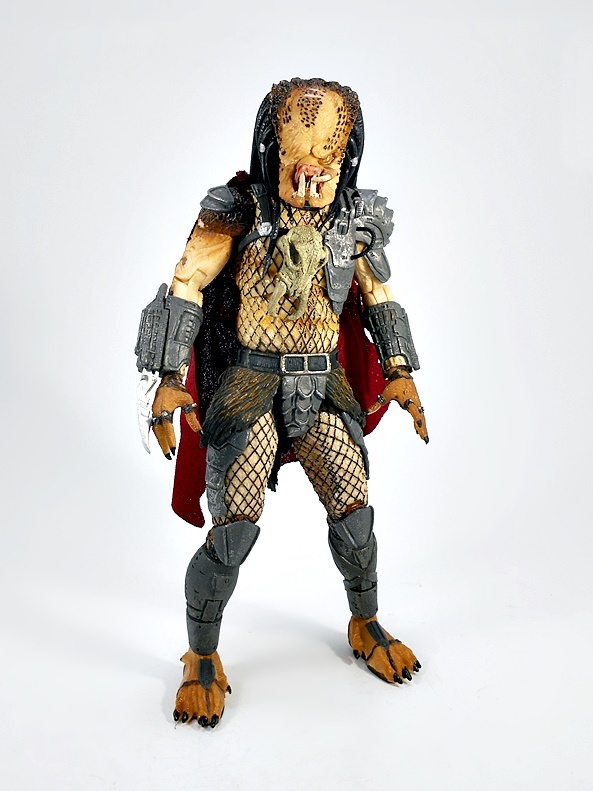 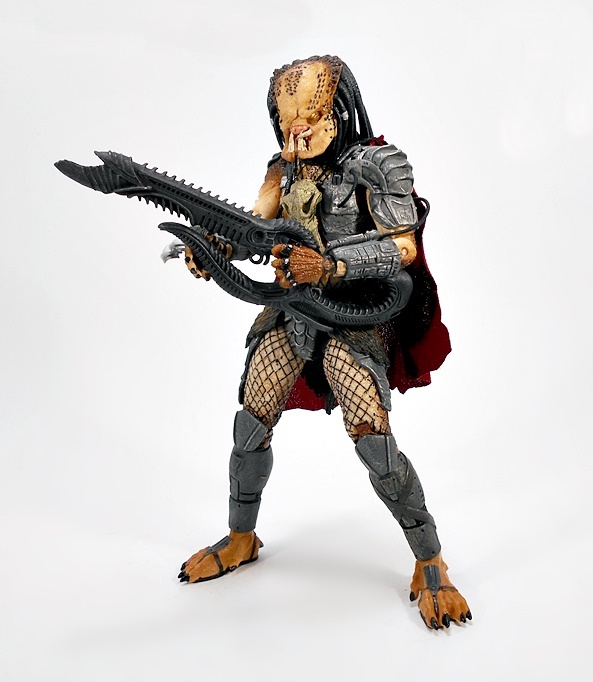 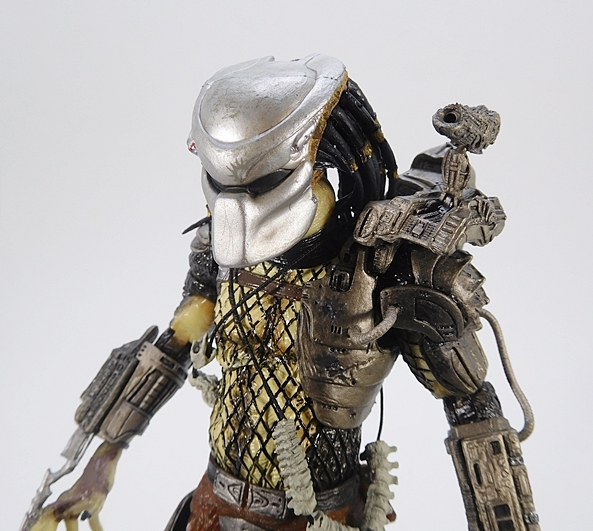 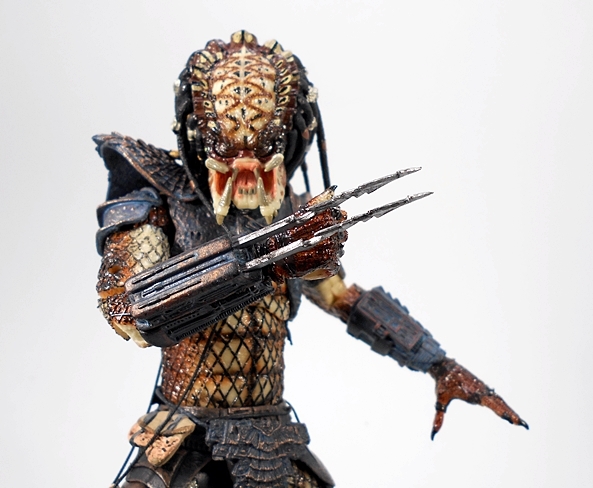 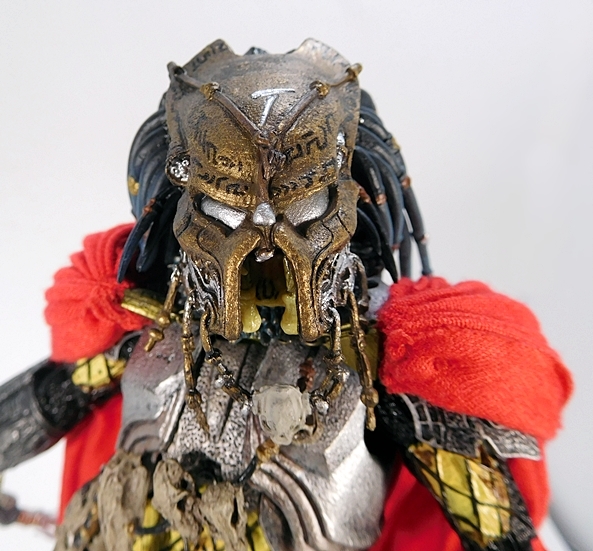 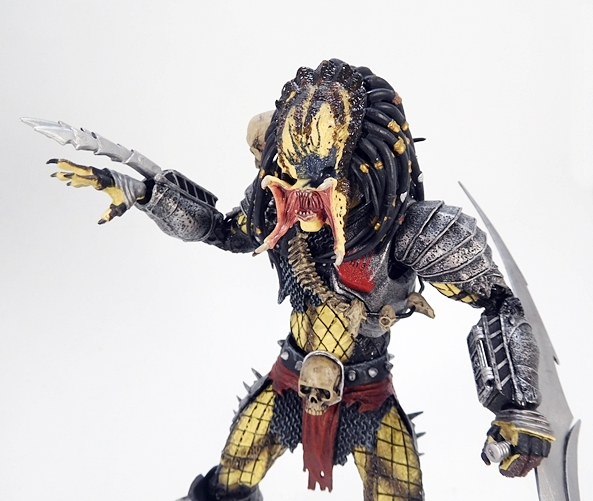 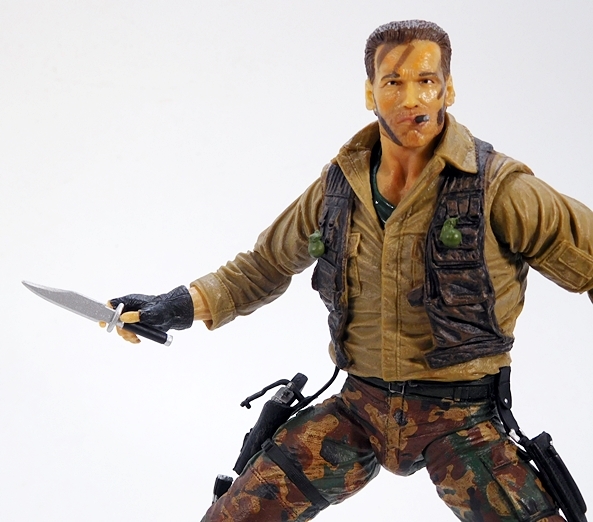 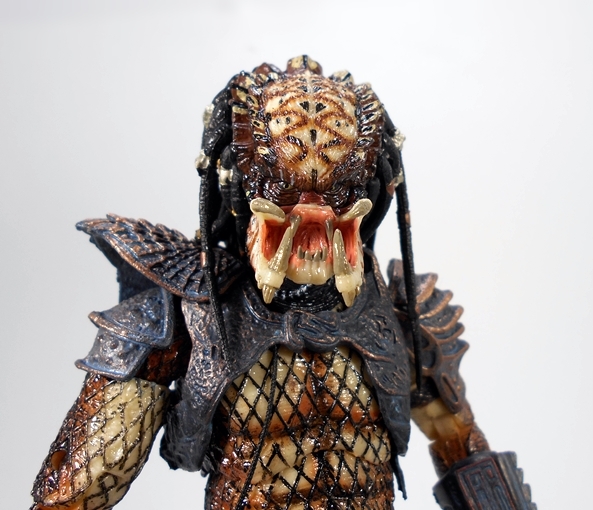 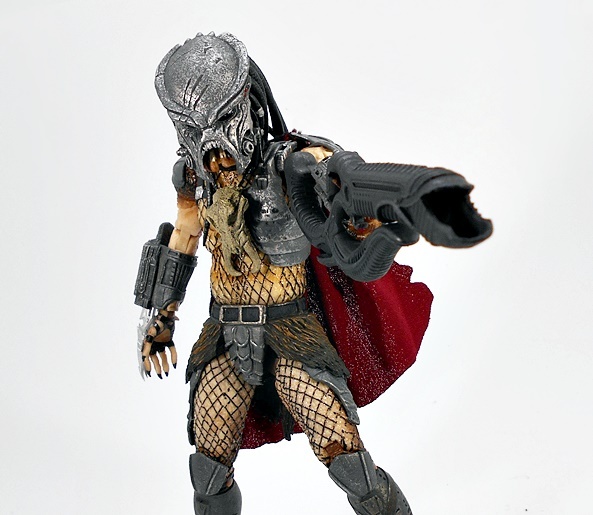 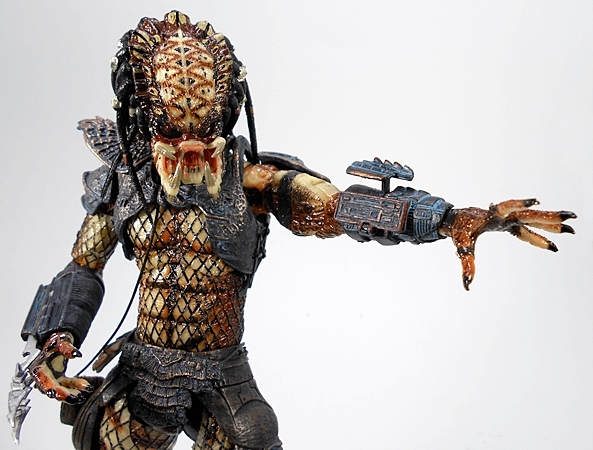 The mandibles look great, which is no surprise, as NECA has been sculpting Predator jowls since Moses wore short pants. 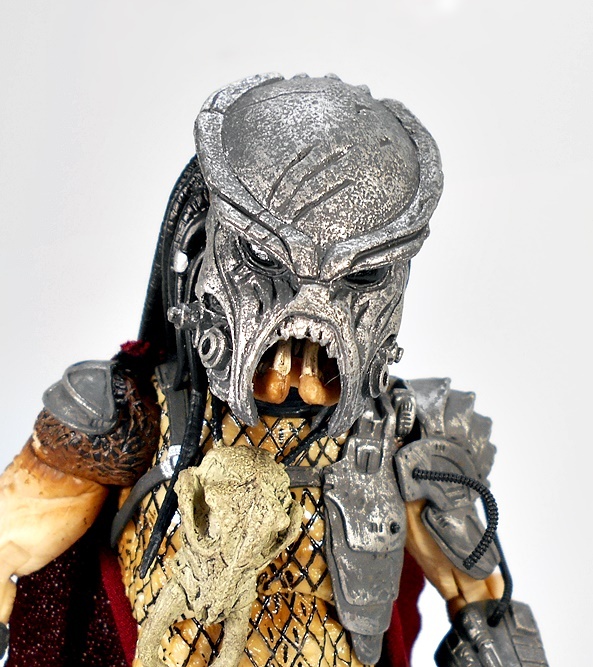 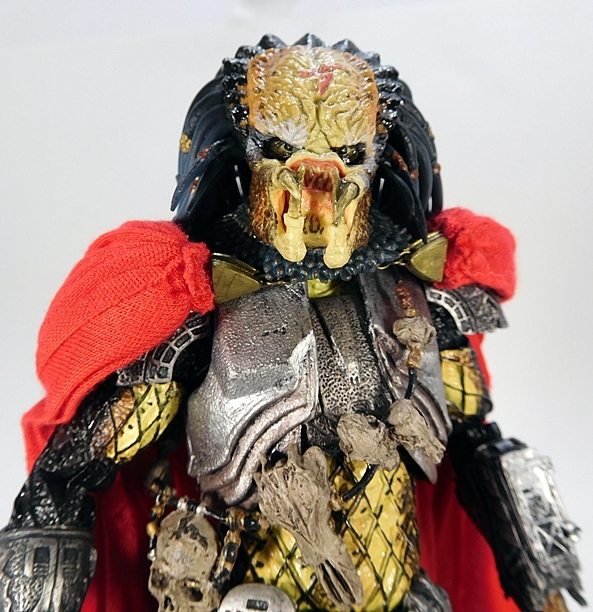 I really dig the extra crinkly forehead, which shows this to be a Grandpa Predator, who wears his years with pride. 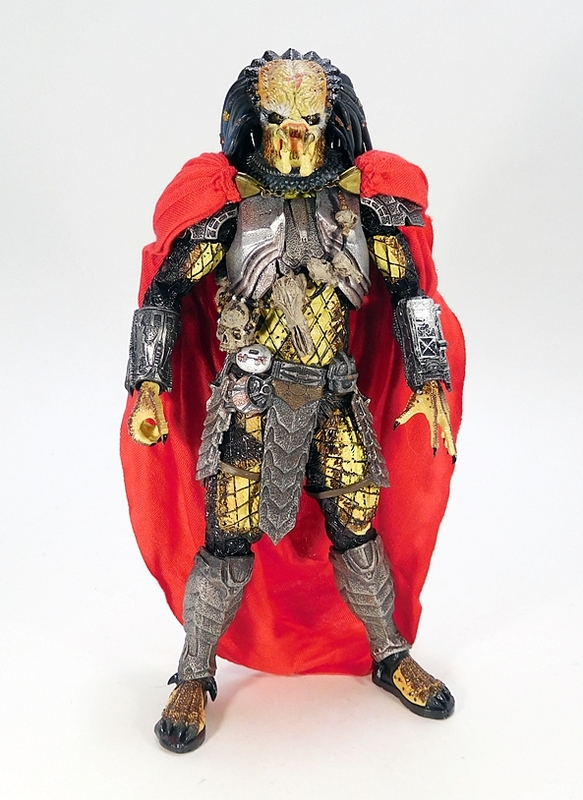 But wait… he also comes with his mask! 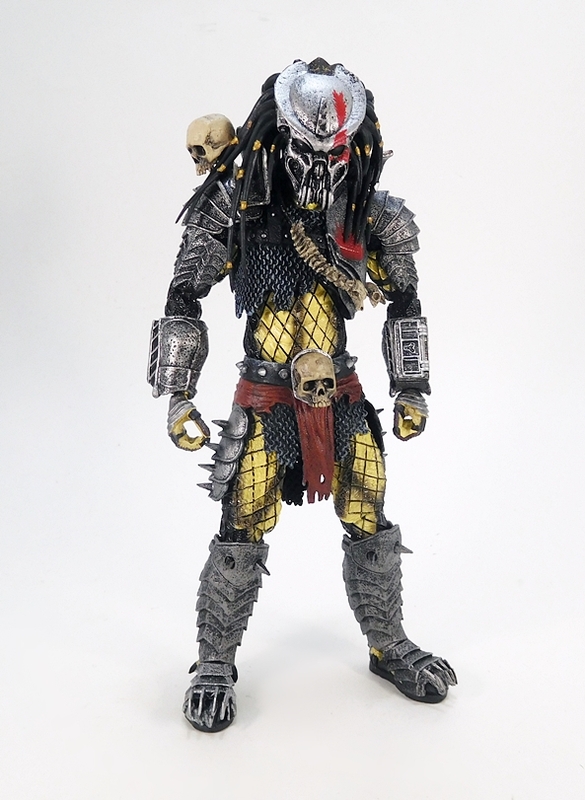 And boy does it look badass! 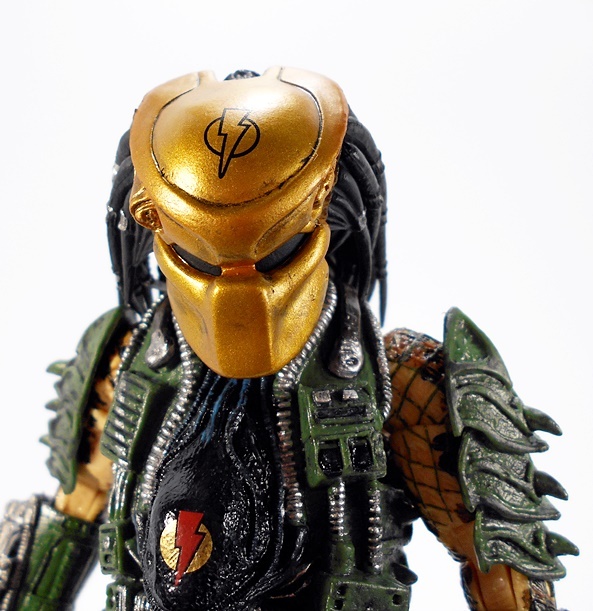 The Ultimate Predators came with a separate head for the masked option, but this guy actually comes with a mask that fits right over the Elder’s face and it actually stays on pretty damn well. 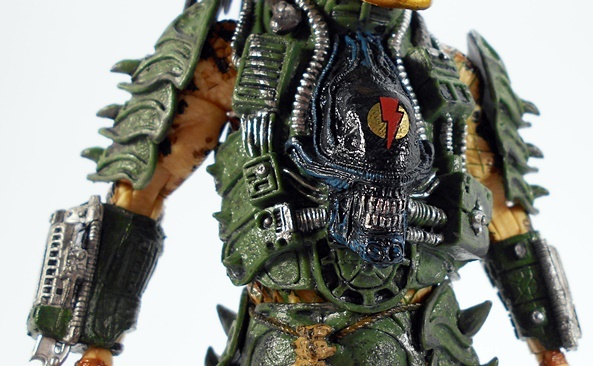 I love the detail on this piece, from the pitted finish in the sculpt to the alien glyphs and silver highlights. 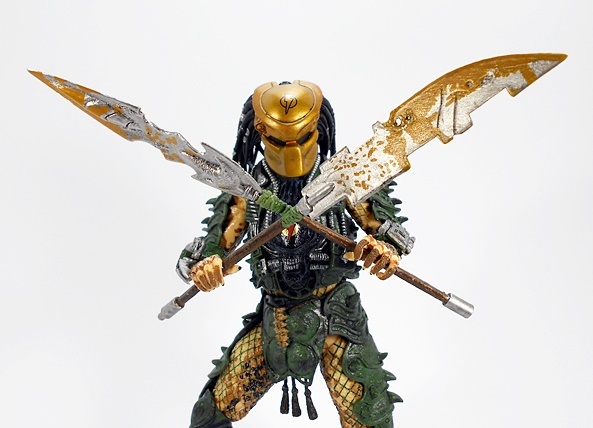 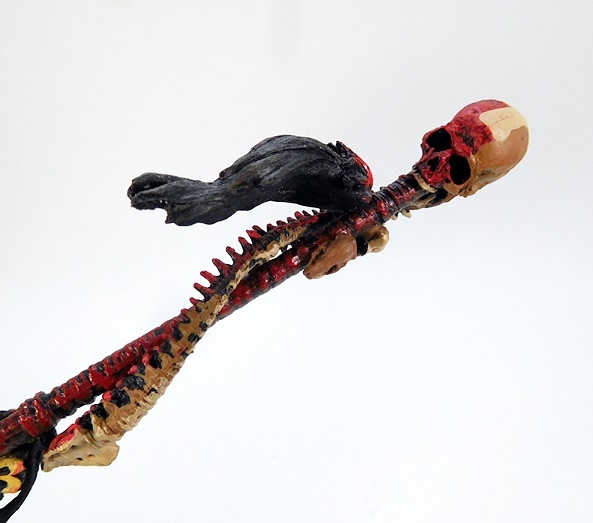 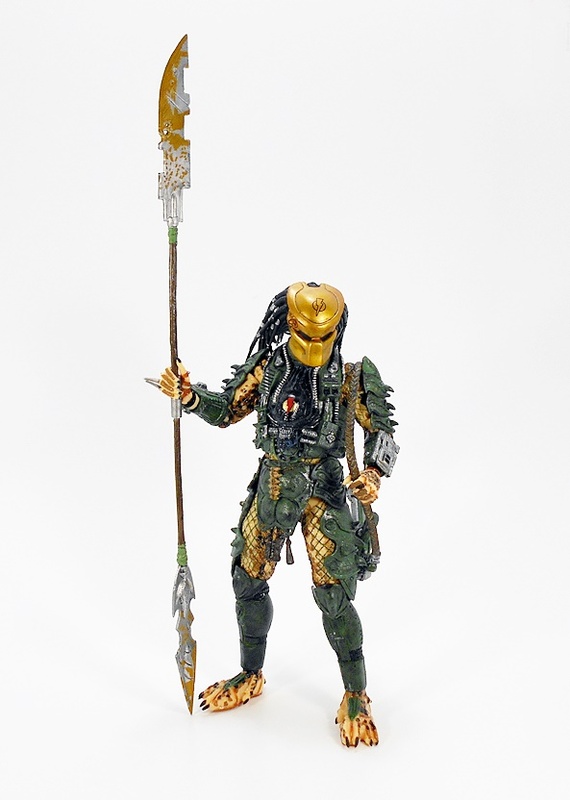 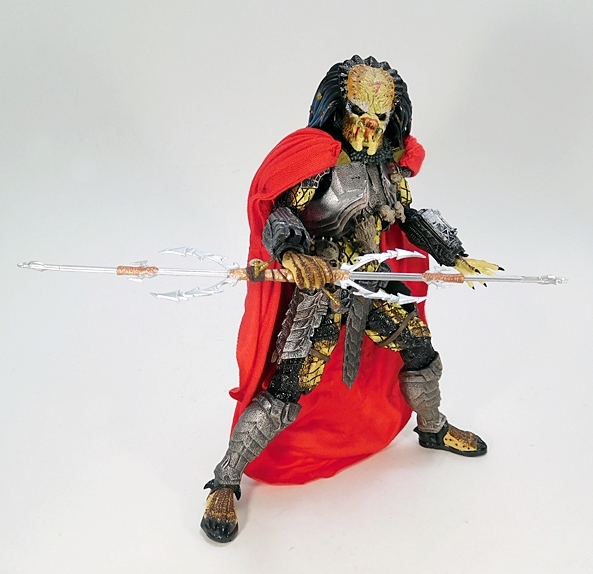 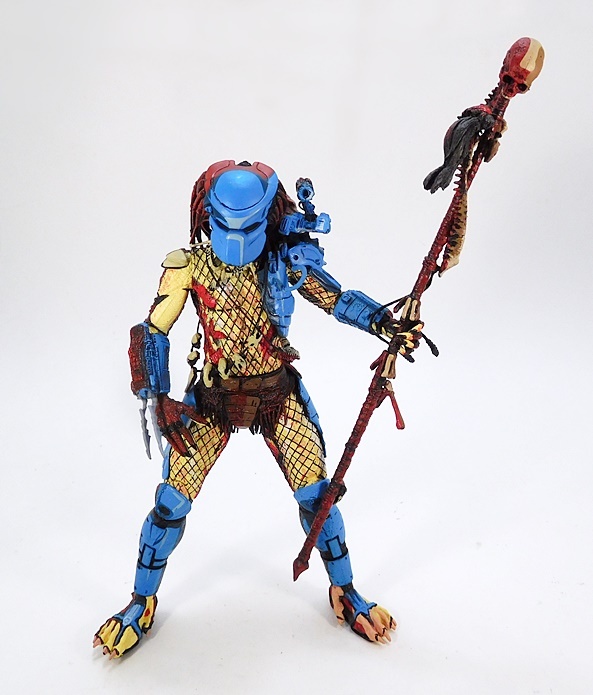 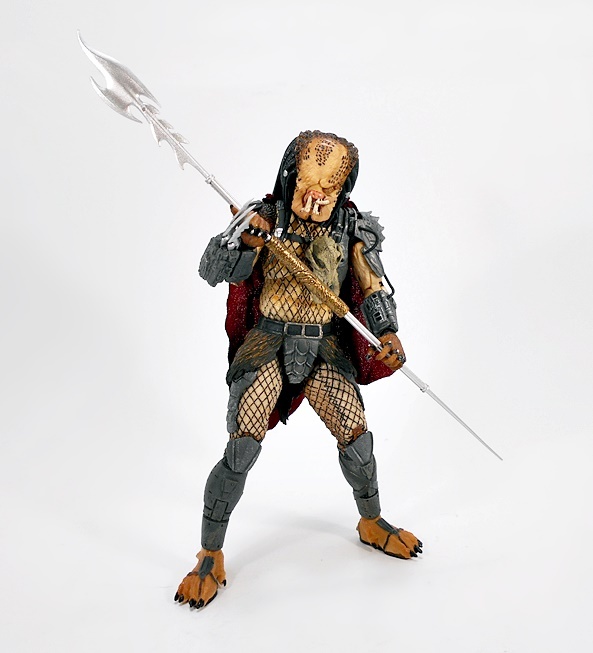 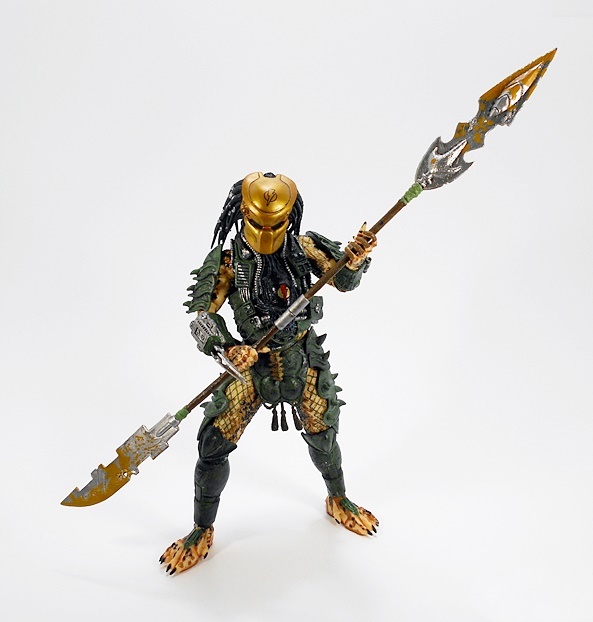 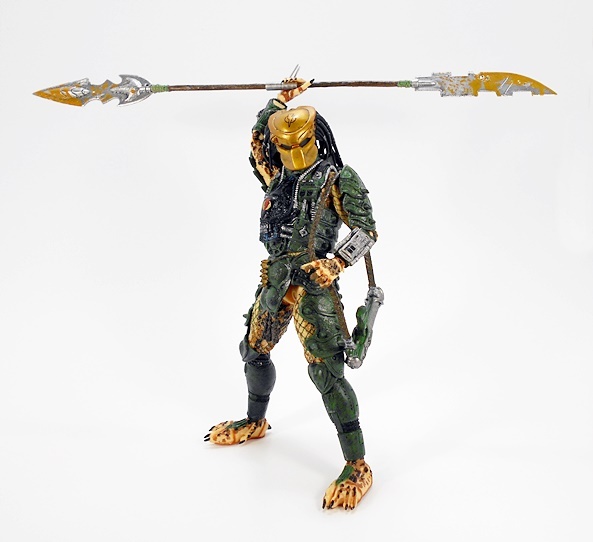 In addition to the mask, Elder Pred also comes with what the package calls his “Ceremonial Staff” but really looks like a gussied up spear. 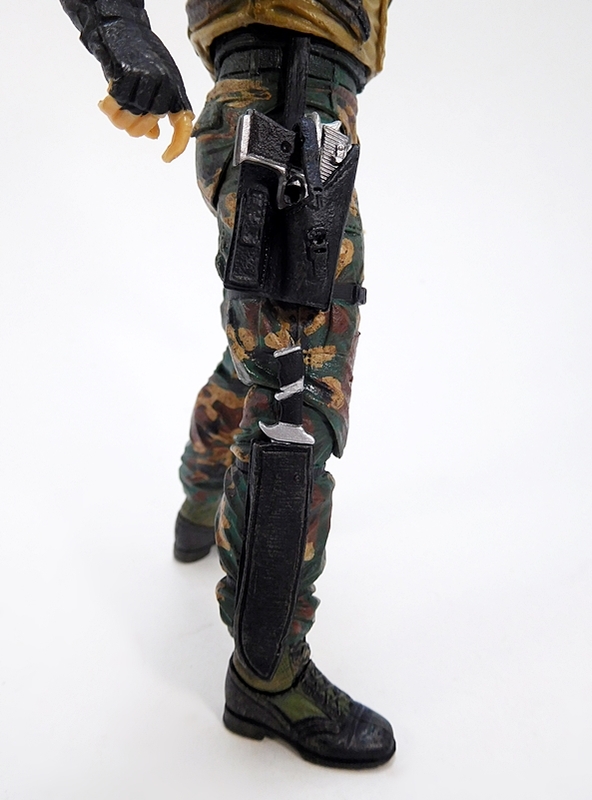 It’s a bit of a frail piece, but it fits perfectly in his right hand. 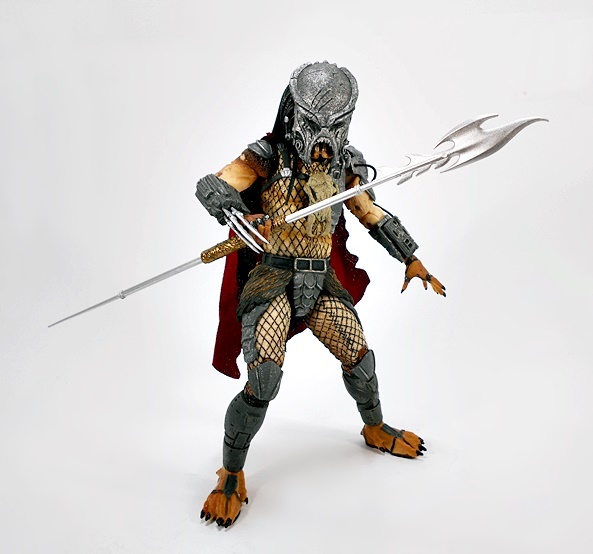 Damn you, Elder Predator, but I can already tell that you are going to be a gateway purchase. 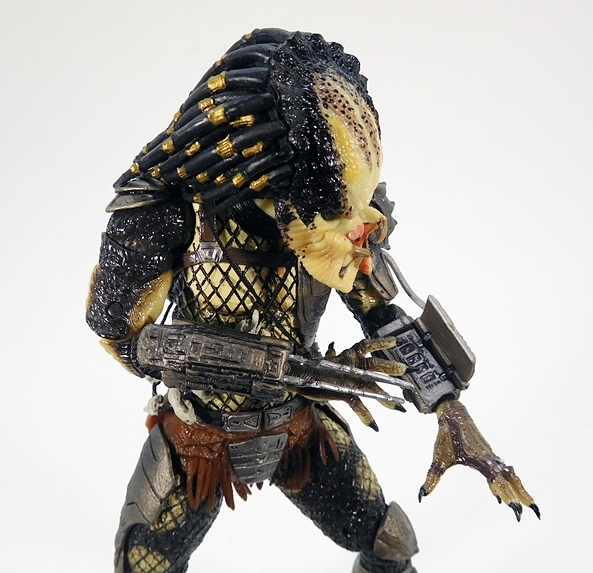 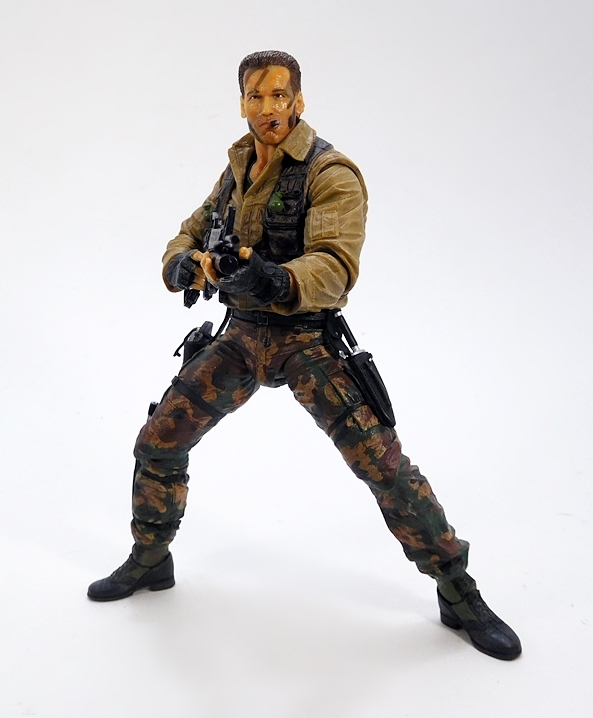 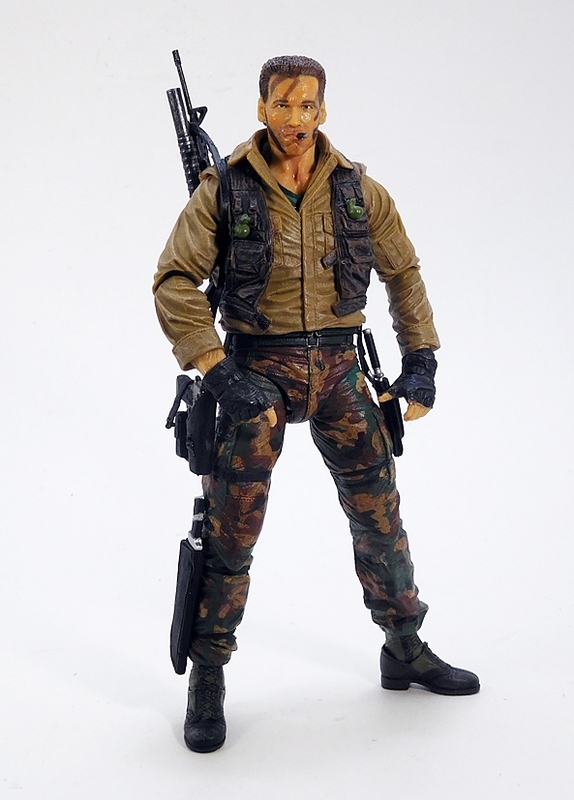 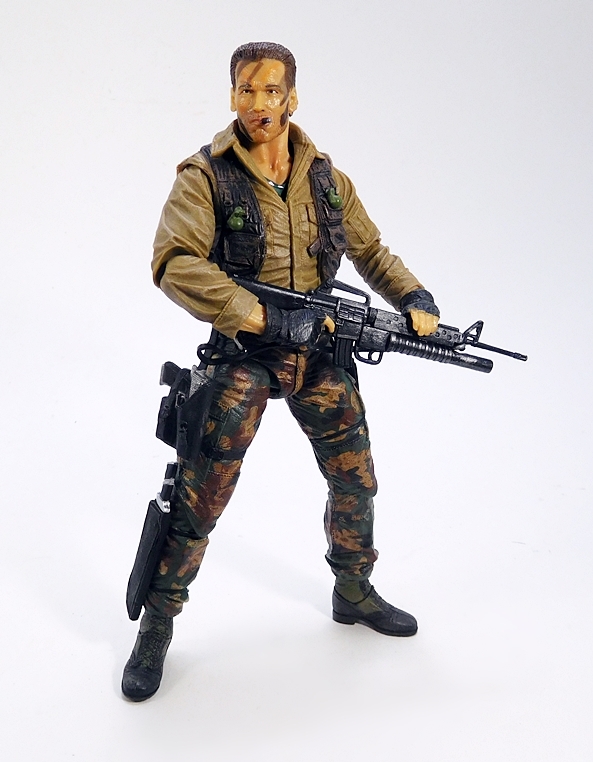 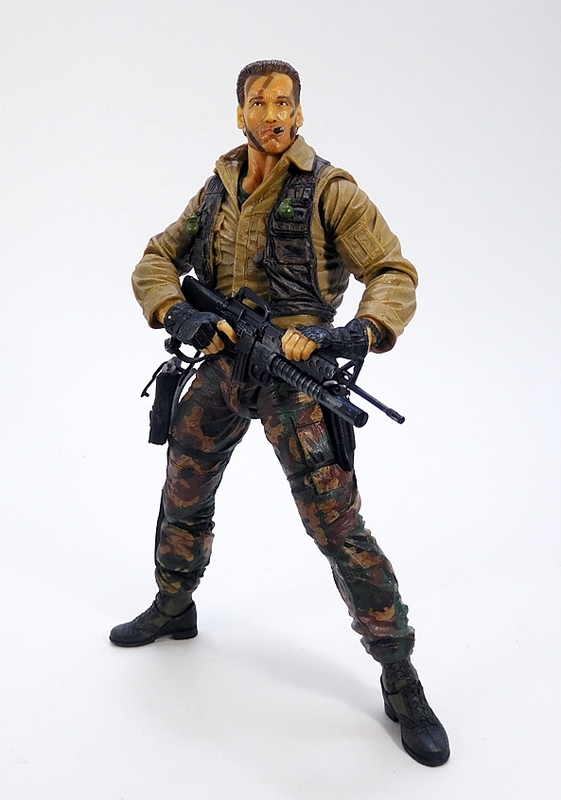 I’m so damn impressed with this figure, that I’ve got no choice but to start picking up some of NECA’s other Pred releases. 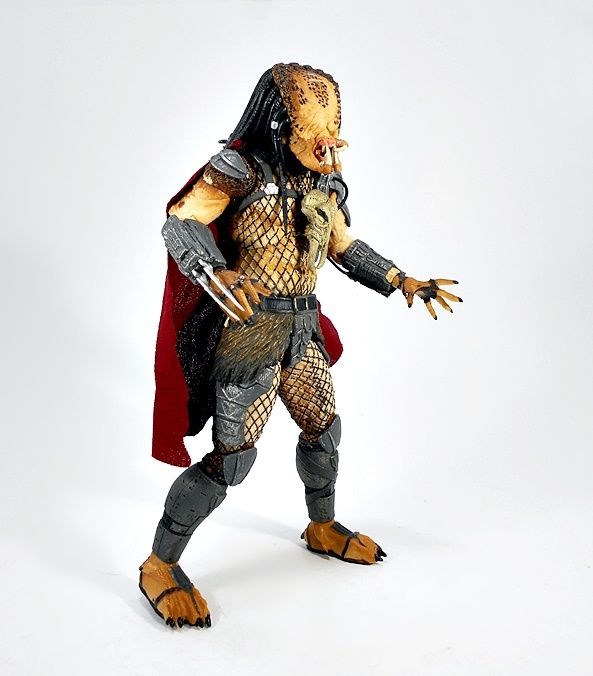 If I had to come up with any gripes about this fellow it would be that at $25, he costs about the same price as the Ultimate Preds and yet comes with a lot less. 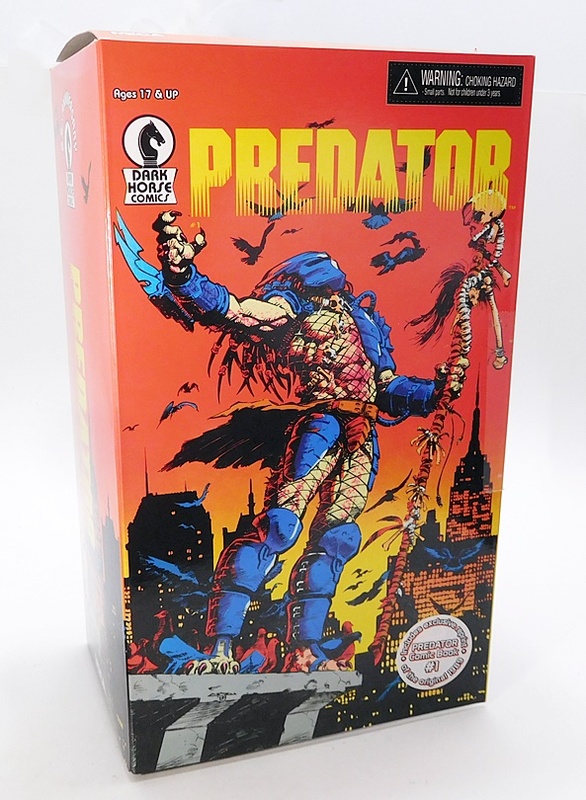 Granted, I’m not accounting for the inflated prices that the bookstores usually slap on their toys, but either way the price is pretty close. 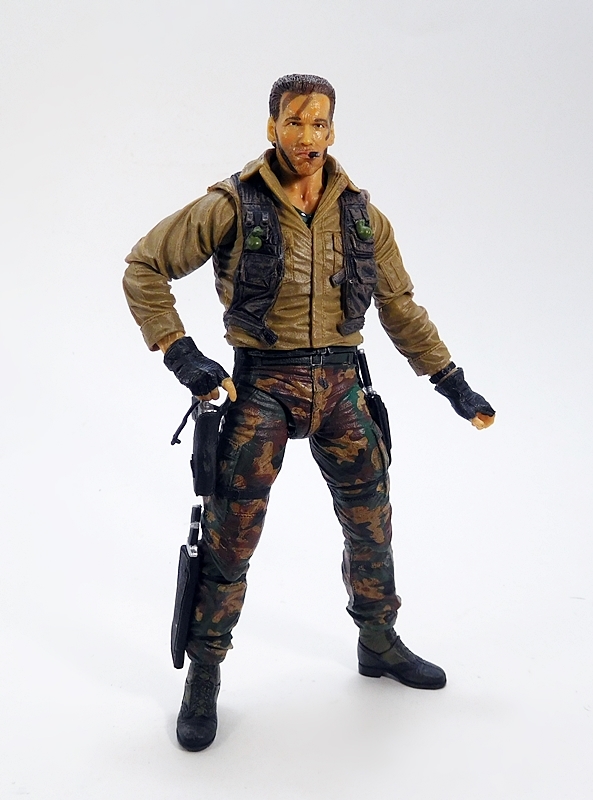 Still, I suppose that’s more of a point of praise that the Ultimate figures can deliver so much, rather than harp on this guy coming with less. 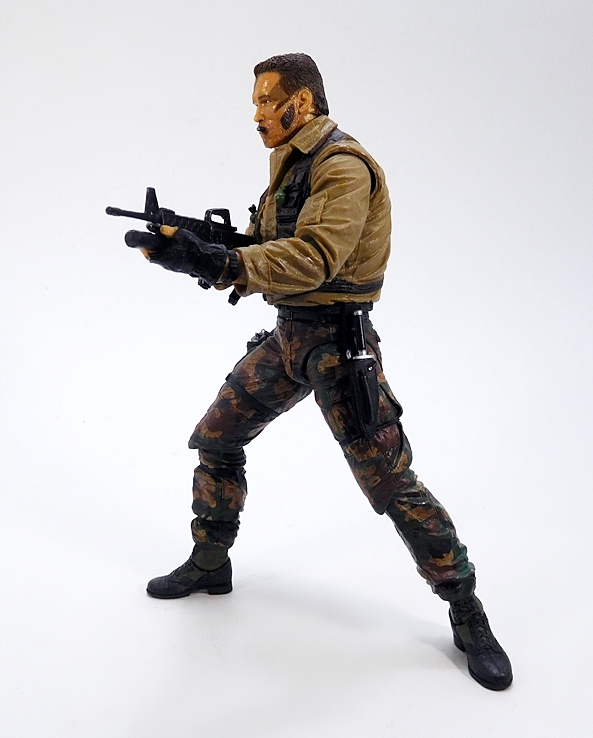 In the end, I still think he was well worth the money.